Engagement with First Nations, Métis, and Inuit Groups with regards to Consultation and Accommodation Prepared for the Congress of Aboriginal Peoples By. 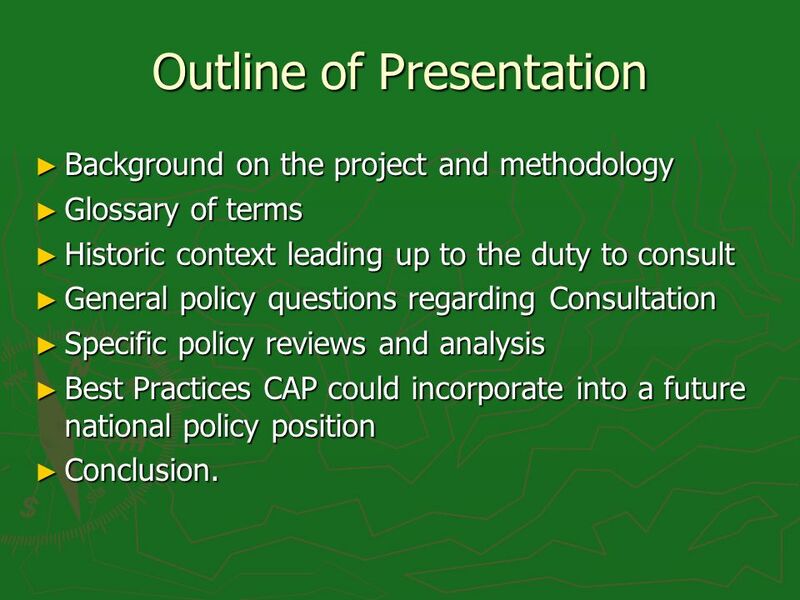 2 Outline of Presentation Background on the project and methodology Background on the project and methodology Glossary of terms Glossary of terms Historic context leading up to the duty to consult Historic context leading up to the duty to consult General policy questions regarding Consultation General policy questions regarding Consultation Specific policy reviews and analysis Specific policy reviews and analysis Best Practices CAP could incorporate into a future national policy position Best Practices CAP could incorporate into a future national policy position Conclusion. 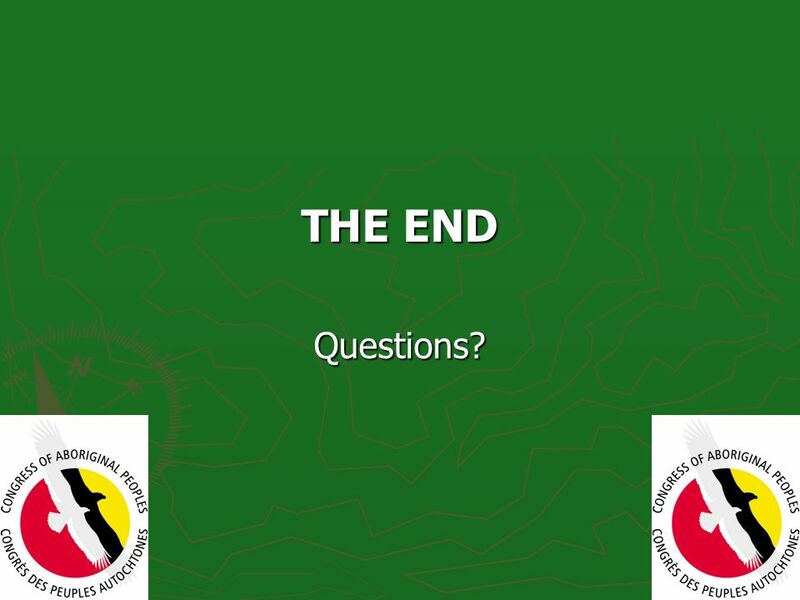 Conclusion. 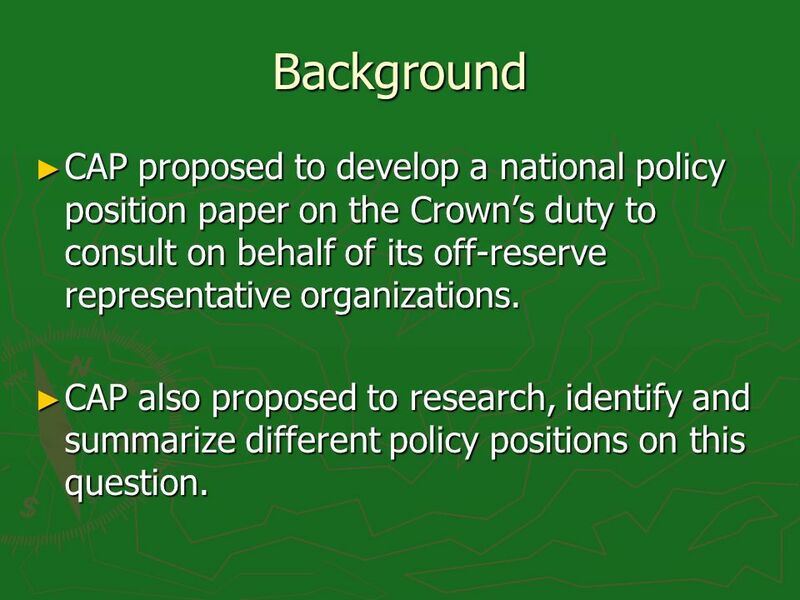 3 Background CAP proposed to develop a national policy position paper on the Crowns duty to consult on behalf of its off-reserve representative organizations. 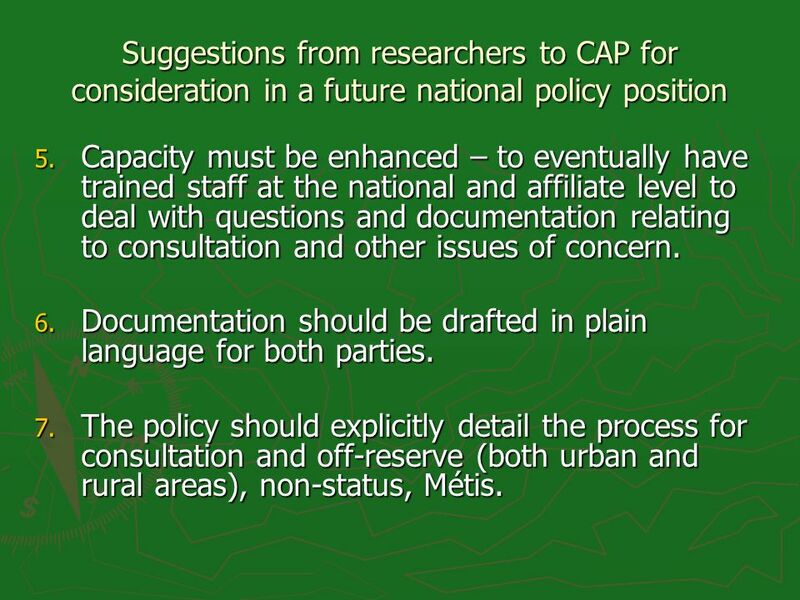 CAP proposed to develop a national policy position paper on the Crowns duty to consult on behalf of its off-reserve representative organizations. CAP also proposed to research, identify and summarize different policy positions on this question. 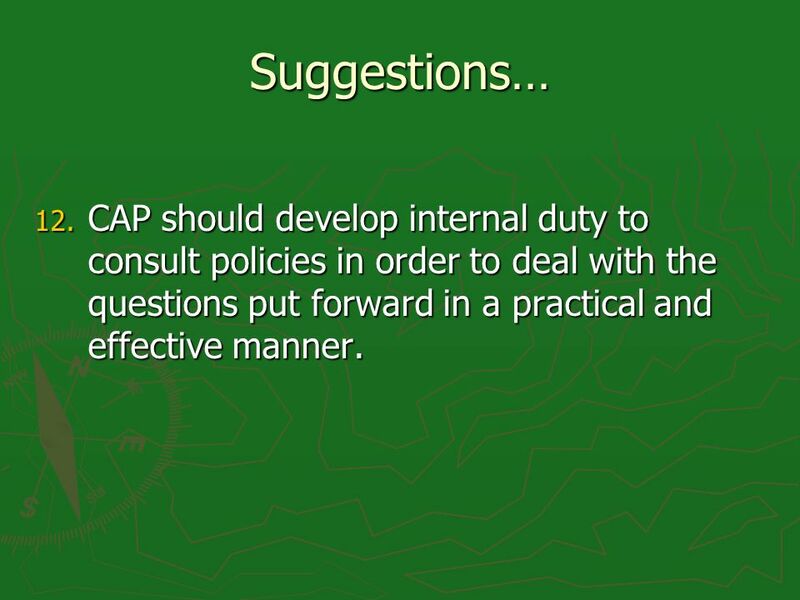 CAP also proposed to research, identify and summarize different policy positions on this question. 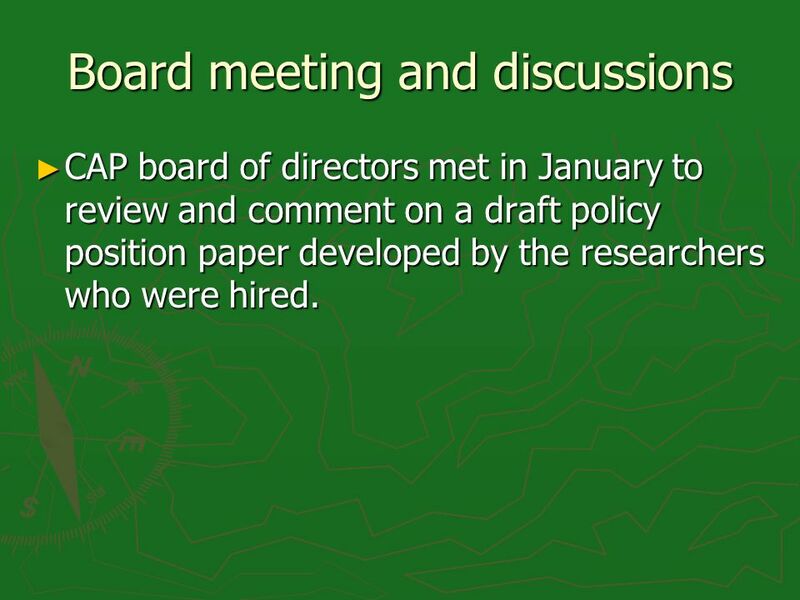 4 Board meeting and discussions CAP board of directors met in January to review and comment on a draft policy position paper developed by the researchers who were hired. CAP board of directors met in January to review and comment on a draft policy position paper developed by the researchers who were hired. 6 Therefore..... Today we will be presenting the results of the substantial academic research completed by the researchers on the general and specific policy questions provided to CAP by OFI. 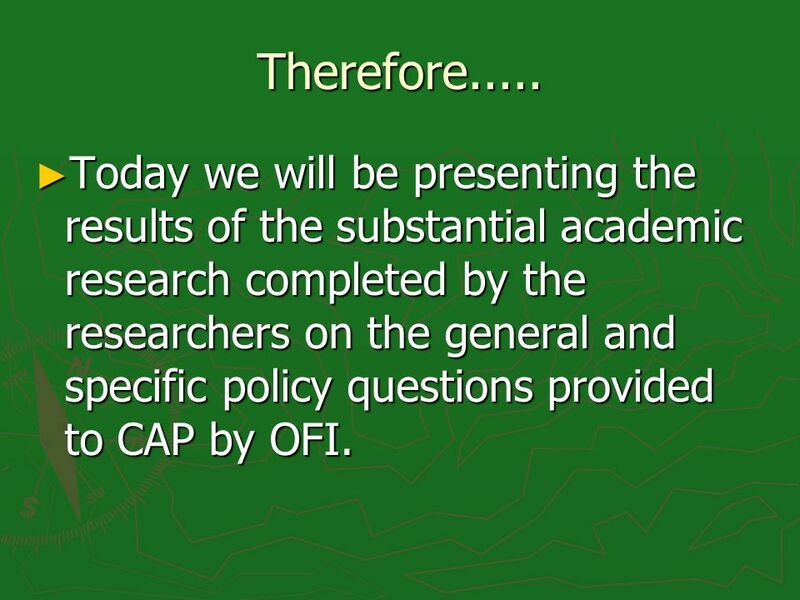 Today we will be presenting the results of the substantial academic research completed by the researchers on the general and specific policy questions provided to CAP by OFI. 7 Outcome of CAP Board meeting CAP Board of Directors identified additional issues and concerns with respect to the duty to consult. These will be expressed in this presentation and in the final report. CAP Board of Directors identified additional issues and concerns with respect to the duty to consult. These will be expressed in this presentation and in the final report. 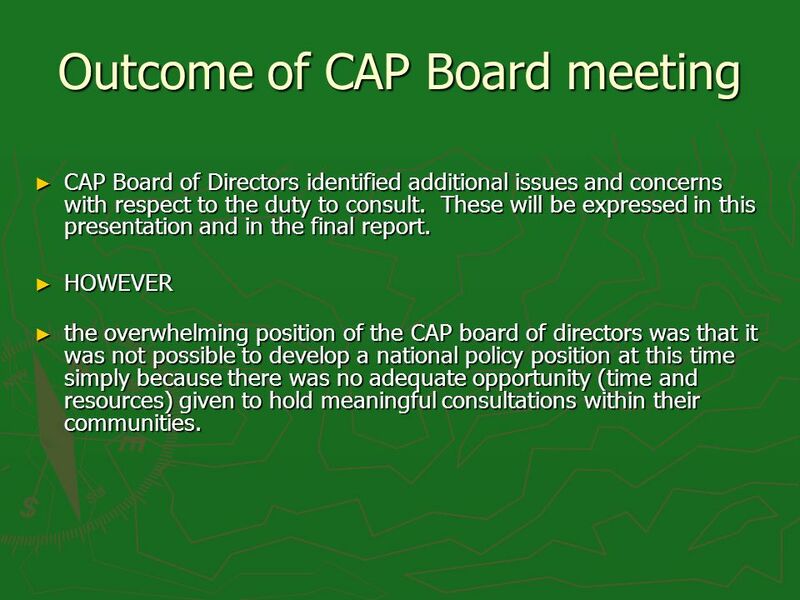 HOWEVER HOWEVER the overwhelming position of the CAP board of directors was that it was not possible to develop a national policy position at this time simply because there was no adequate opportunity (time and resources) given to hold meaningful consultations within their communities. the overwhelming position of the CAP board of directors was that it was not possible to develop a national policy position at this time simply because there was no adequate opportunity (time and resources) given to hold meaningful consultations within their communities. 8 AND This research may serve as a foundation upon which CAP may eventually build their national policy position. This research may serve as a foundation upon which CAP may eventually build their national policy position. The best practices presented as recommendations at the end of the power point and final report represent the minimum standards already accepted by the Canadian Courts, some provincial governments, industry policies and in the international arena. The best practices presented as recommendations at the end of the power point and final report represent the minimum standards already accepted by the Canadian Courts, some provincial governments, industry policies and in the international arena. The researchers have ventured to add some additional policy recommendations for CAP that may or may not ultimately be reflected in the CAP National Policy Position. The researchers have ventured to add some additional policy recommendations for CAP that may or may not ultimately be reflected in the CAP National Policy Position. 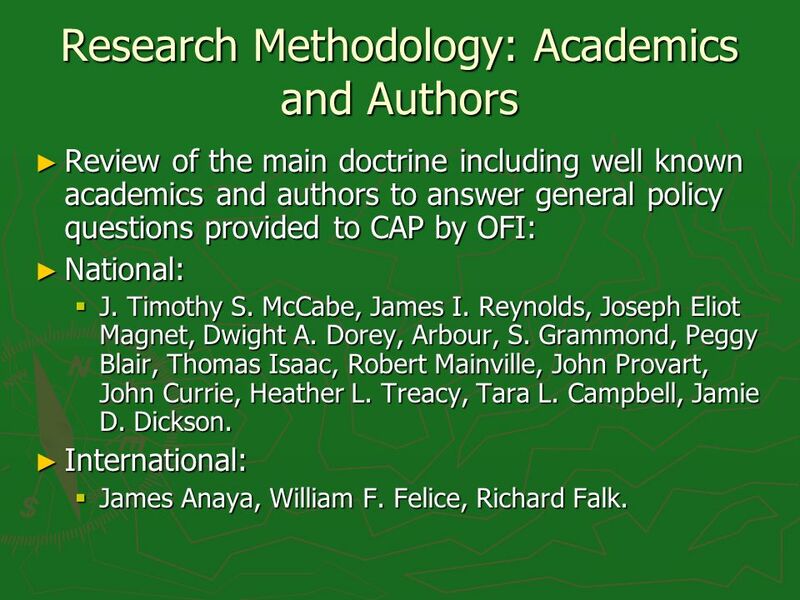 9 Research Methodology: Academics and Authors Review of the main doctrine including well known academics and authors to answer general policy questions provided to CAP by OFI: Review of the main doctrine including well known academics and authors to answer general policy questions provided to CAP by OFI: National: National: J. Timothy S. McCabe, James I. Reynolds, Joseph Eliot Magnet, Dwight A. Dorey, Arbour, S. Grammond, Peggy Blair, Thomas Isaac, Robert Mainville, John Provart, John Currie, Heather L. Treacy, Tara L. Campbell, Jamie D. Dickson. J. Timothy S. McCabe, James I. Reynolds, Joseph Eliot Magnet, Dwight A. Dorey, Arbour, S. Grammond, Peggy Blair, Thomas Isaac, Robert Mainville, John Provart, John Currie, Heather L. Treacy, Tara L. Campbell, Jamie D. Dickson. International: International: James Anaya, William F. Felice, Richard Falk. James Anaya, William F. Felice, Richard Falk. 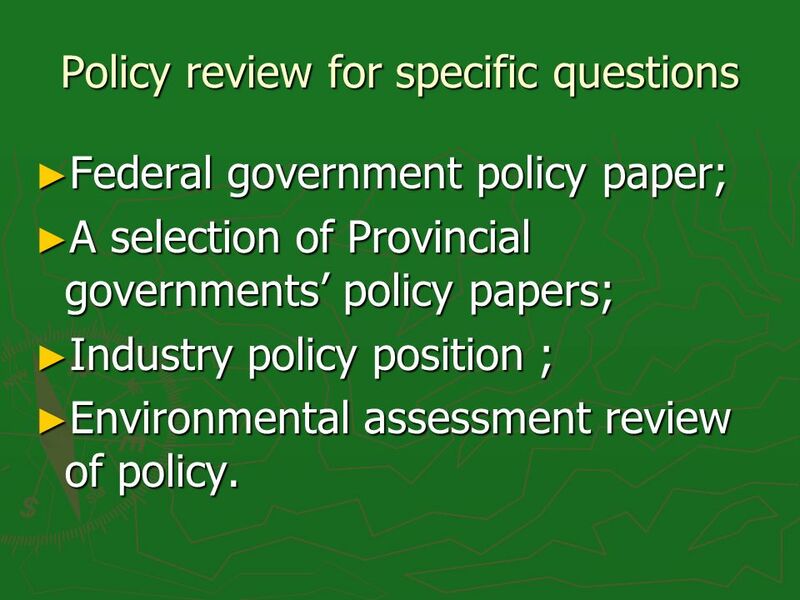 11 Policy review for specific questions Federal government policy paper; Federal government policy paper; A selection of Provincial governments policy papers; A selection of Provincial governments policy papers; Industry policy position ; Industry policy position ; Environmental assessment review of policy. 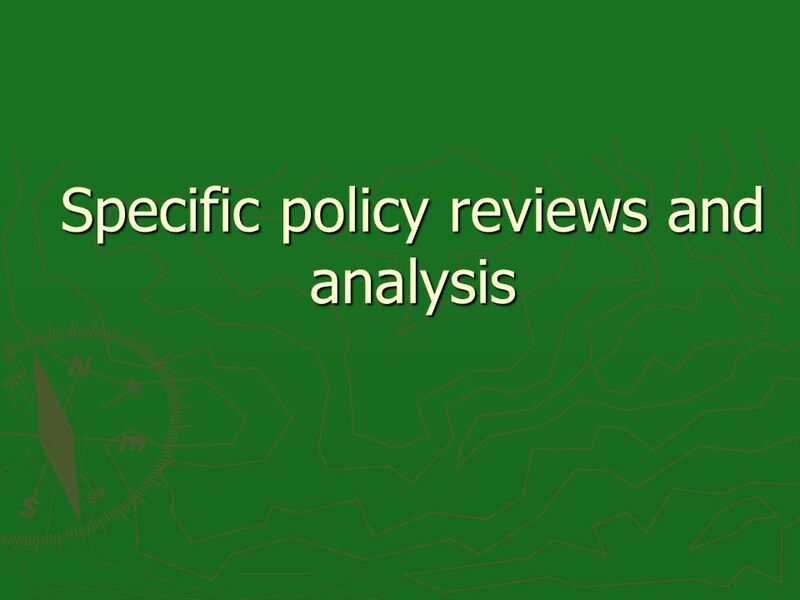 Environmental assessment review of policy. 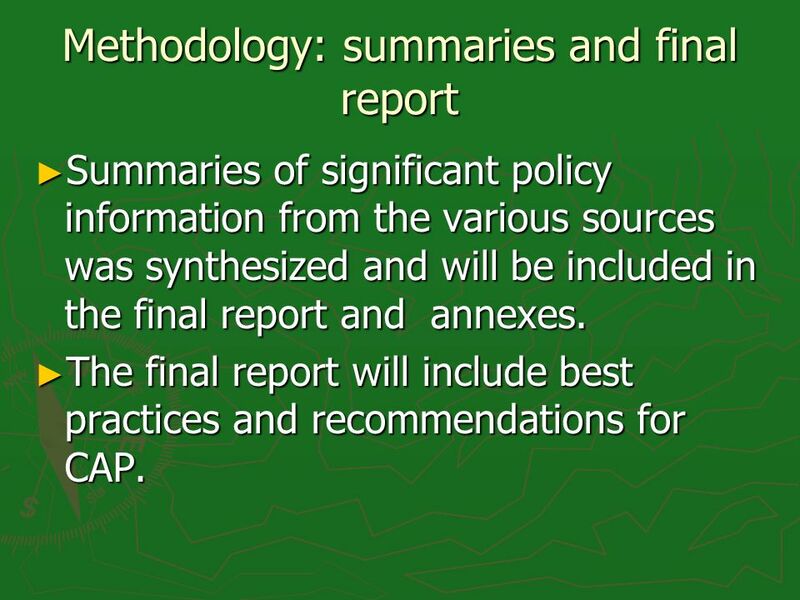 12 Methodology: summaries and final report Summaries of significant policy information from the various sources was synthesized and will be included in the final report and annexes. Summaries of significant policy information from the various sources was synthesized and will be included in the final report and annexes. The final report will include best practices and recommendations for CAP. The final report will include best practices and recommendations for CAP. 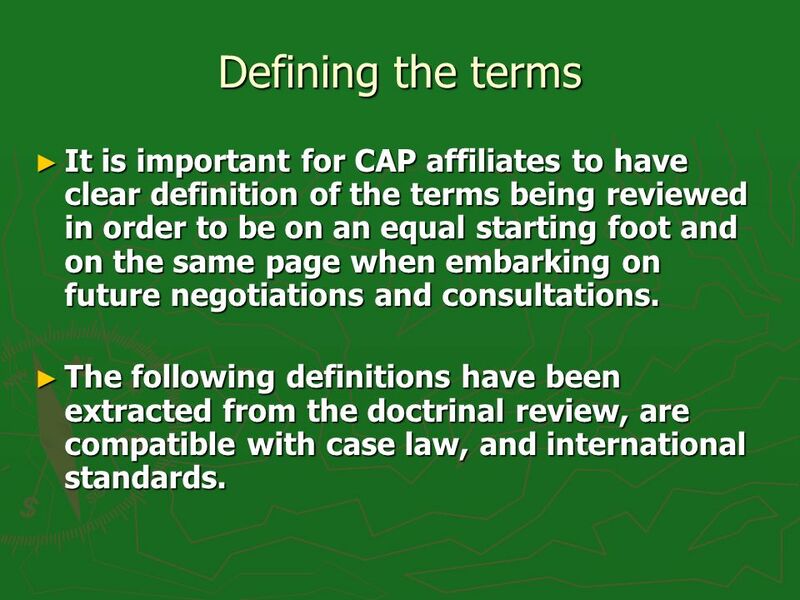 13 Defining the terms It is important for CAP affiliates to have clear definition of the terms being reviewed in order to be on an equal starting foot and on the same page when embarking on future negotiations and consultations. It is important for CAP affiliates to have clear definition of the terms being reviewed in order to be on an equal starting foot and on the same page when embarking on future negotiations and consultations. The following definitions have been extracted from the doctrinal review, are compatible with case law, and international standards. The following definitions have been extracted from the doctrinal review, are compatible with case law, and international standards. 16 Characteristics of Fiduciary duty It is inherent to the Honour of the Crown. It is inherent to the Honour of the Crown. 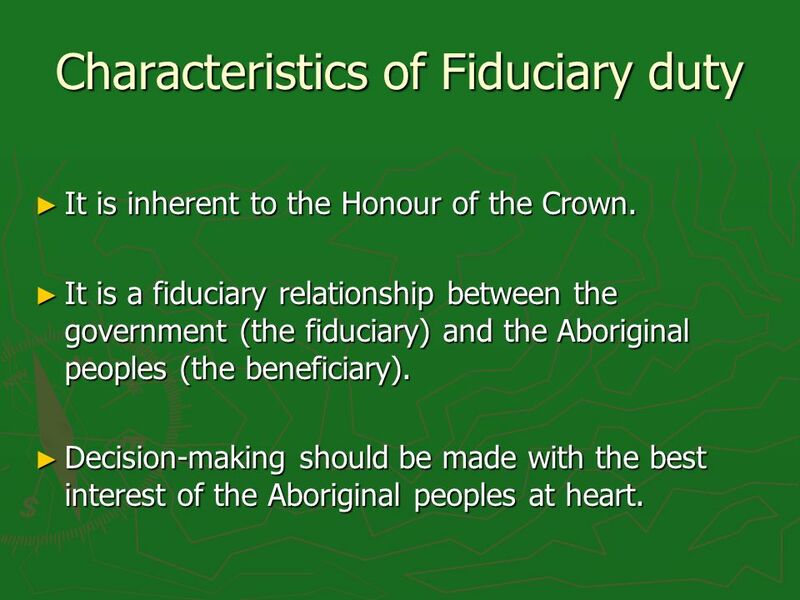 It is a fiduciary relationship between the government (the fiduciary) and the Aboriginal peoples (the beneficiary). 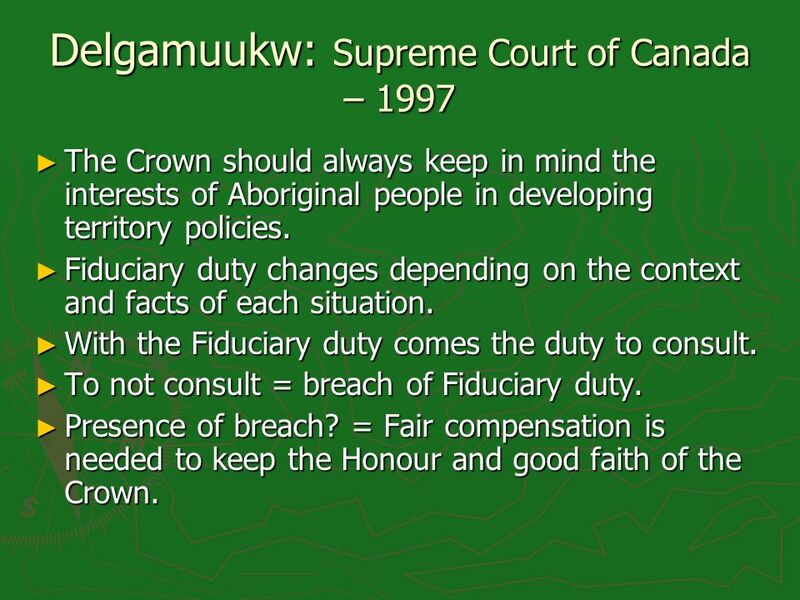 It is a fiduciary relationship between the government (the fiduciary) and the Aboriginal peoples (the beneficiary). Decision-making should be made with the best interest of the Aboriginal peoples at heart. Decision-making should be made with the best interest of the Aboriginal peoples at heart. 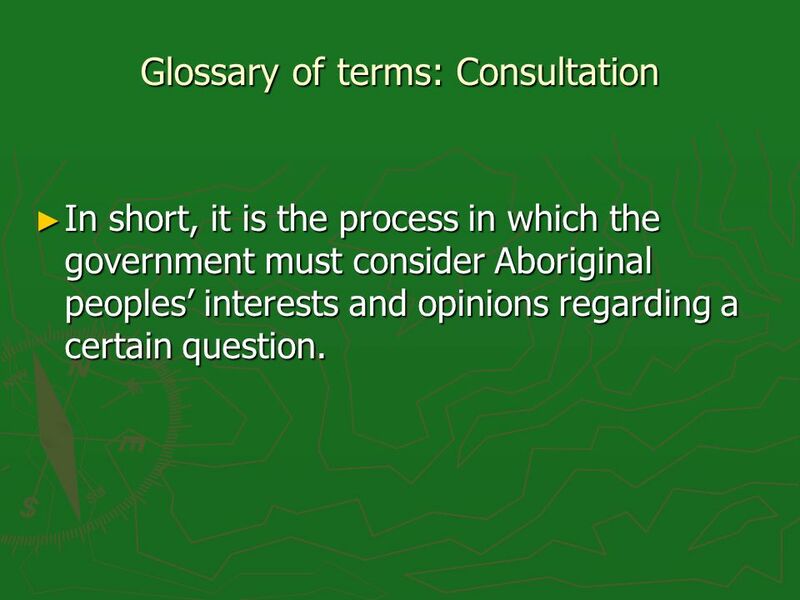 17 Glossary of terms: Consultation In short, it is the process in which the government must consider Aboriginal peoples interests and opinions regarding a certain question. In short, it is the process in which the government must consider Aboriginal peoples interests and opinions regarding a certain question. 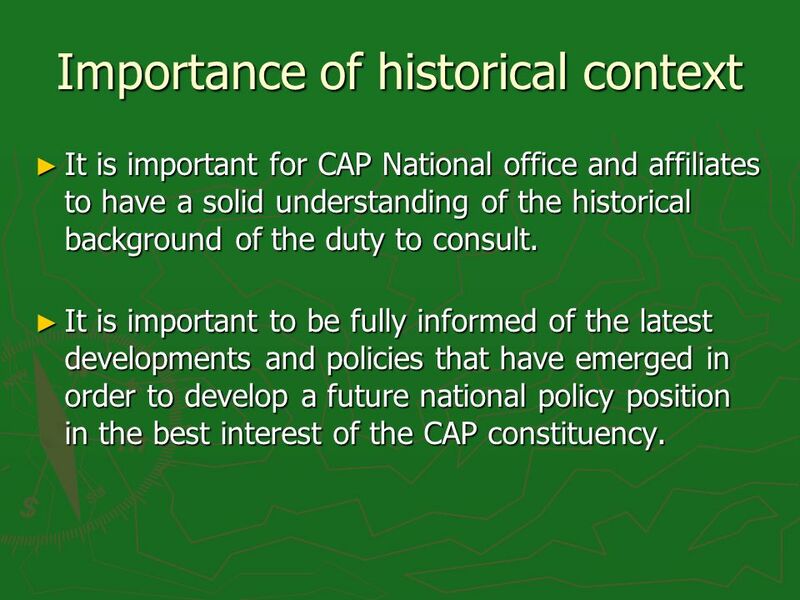 20 Importance of historical context It is important for CAP National office and affiliates to have a solid understanding of the historical background of the duty to consult. It is important for CAP National office and affiliates to have a solid understanding of the historical background of the duty to consult. It is important to be fully informed of the latest developments and policies that have emerged in order to develop a future national policy position in the best interest of the CAP constituency. It is important to be fully informed of the latest developments and policies that have emerged in order to develop a future national policy position in the best interest of the CAP constituency. 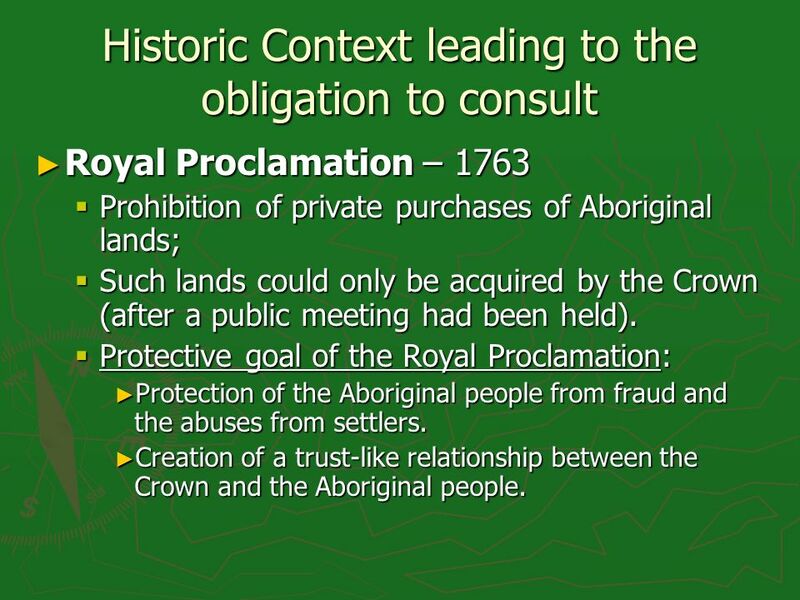 22 Historic Context leading to the obligation to consult Royal Proclamation – 1763 Royal Proclamation – 1763 Prohibition of private purchases of Aboriginal lands; Prohibition of private purchases of Aboriginal lands; Such lands could only be acquired by the Crown (after a public meeting had been held). Such lands could only be acquired by the Crown (after a public meeting had been held). Protective goal of the Royal Proclamation: Protective goal of the Royal Proclamation: Protection of the Aboriginal people from fraud and the abuses from settlers. Protection of the Aboriginal people from fraud and the abuses from settlers. Creation of a trust-like relationship between the Crown and the Aboriginal people. Creation of a trust-like relationship between the Crown and the Aboriginal people. 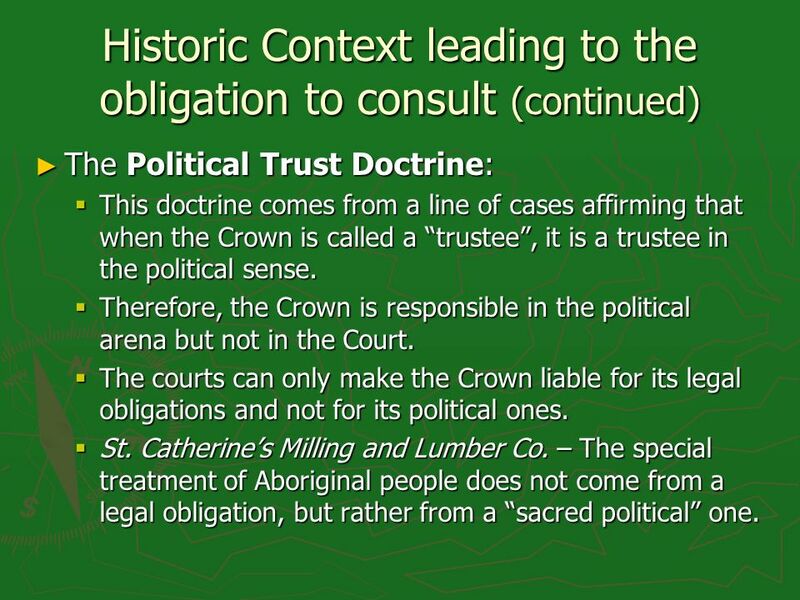 23 Historic Context leading to the obligation to consult (continued) The Political Trust Doctrine: The Political Trust Doctrine: This doctrine comes from a line of cases affirming that when the Crown is called a trustee, it is a trustee in the political sense. This doctrine comes from a line of cases affirming that when the Crown is called a trustee, it is a trustee in the political sense. Therefore, the Crown is responsible in the political arena but not in the Court. Therefore, the Crown is responsible in the political arena but not in the Court. The courts can only make the Crown liable for its legal obligations and not for its political ones. The courts can only make the Crown liable for its legal obligations and not for its political ones. St. Catherines Milling and Lumber Co. – The special treatment of Aboriginal people does not come from a legal obligation, but rather from a sacred political one. St. Catherines Milling and Lumber Co. – The special treatment of Aboriginal people does not come from a legal obligation, but rather from a sacred political one. 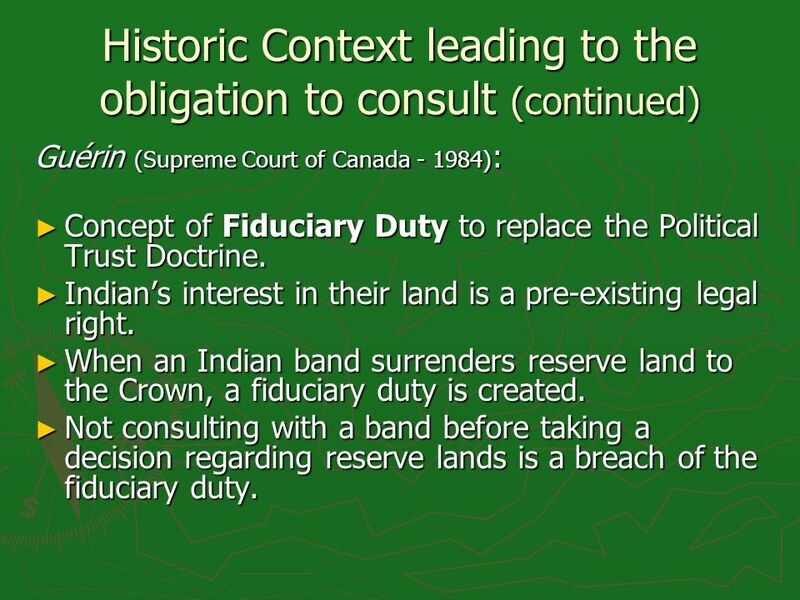 24 Historic Context leading to the obligation to consult (continued) Guérin (Supreme Court of Canada - 1984) : Concept of Fiduciary Duty to replace the Political Trust Doctrine. Concept of Fiduciary Duty to replace the Political Trust Doctrine. Indians interest in their land is a pre-existing legal right. Indians interest in their land is a pre-existing legal right. When an Indian band surrenders reserve land to the Crown, a fiduciary duty is created. When an Indian band surrenders reserve land to the Crown, a fiduciary duty is created. Not consulting with a band before taking a decision regarding reserve lands is a breach of the fiduciary duty. Not consulting with a band before taking a decision regarding reserve lands is a breach of the fiduciary duty. 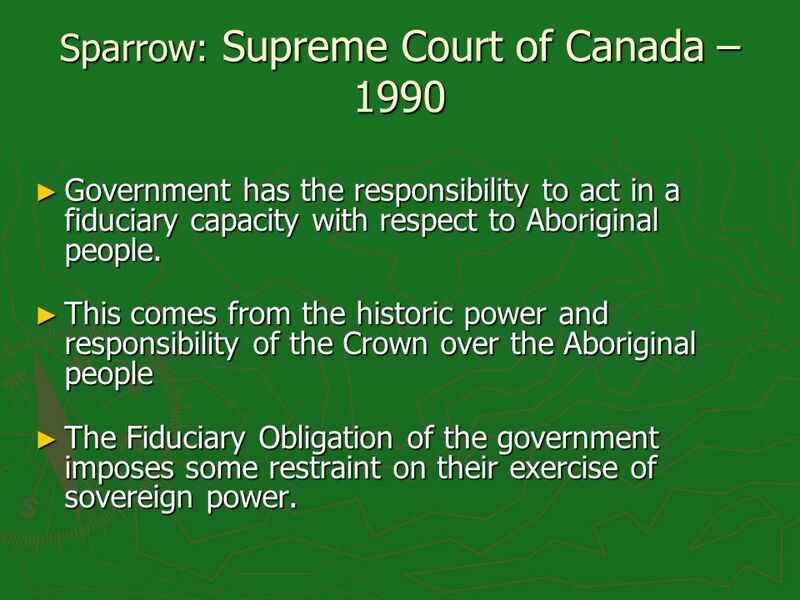 25 Sparrow: Supreme Court of Canada – 1990 Government has the responsibility to act in a fiduciary capacity with respect to Aboriginal people. Government has the responsibility to act in a fiduciary capacity with respect to Aboriginal people. This comes from the historic power and responsibility of the Crown over the Aboriginal people This comes from the historic power and responsibility of the Crown over the Aboriginal people The Fiduciary Obligation of the government imposes some restraint on their exercise of sovereign power. The Fiduciary Obligation of the government imposes some restraint on their exercise of sovereign power. 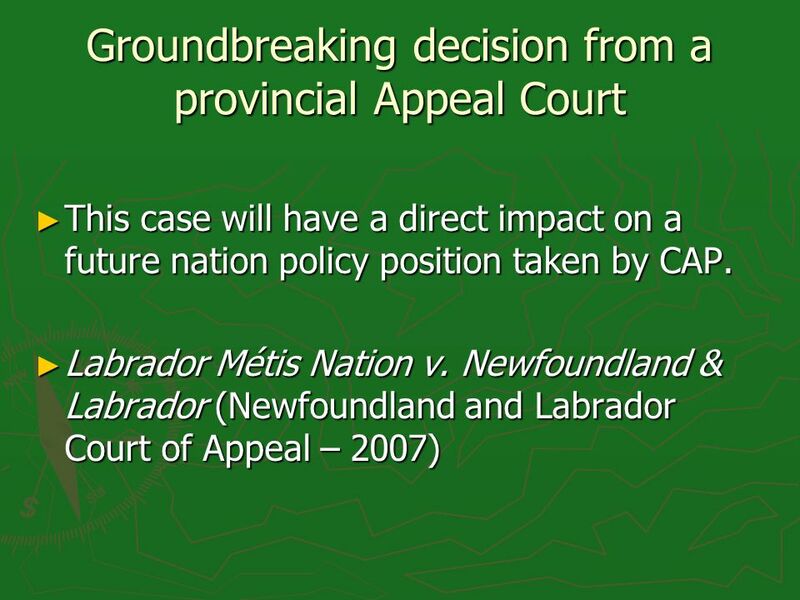 26 Delgamuukw: Supreme Court of Canada – 1997 The Crown should always keep in mind the interests of Aboriginal people in developing territory policies. The Crown should always keep in mind the interests of Aboriginal people in developing territory policies. 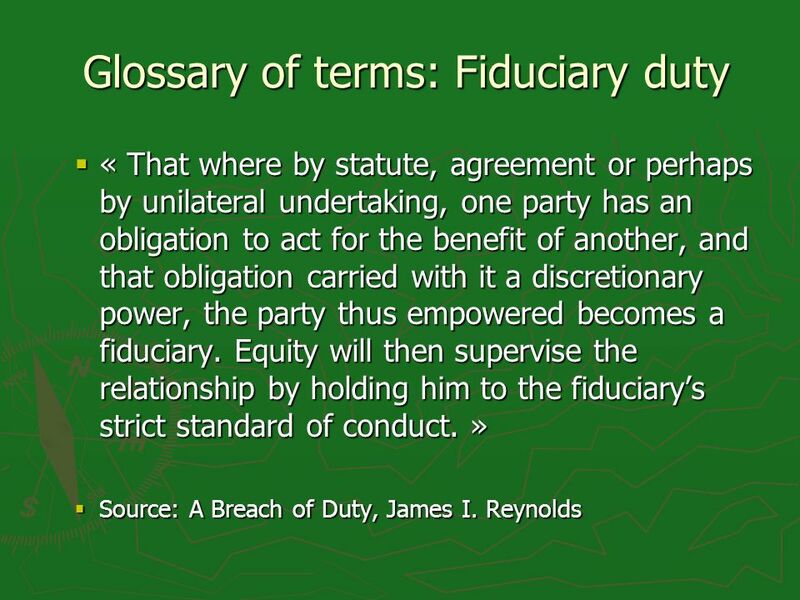 Fiduciary duty changes depending on the context and facts of each situation. Fiduciary duty changes depending on the context and facts of each situation. With the Fiduciary duty comes the duty to consult. With the Fiduciary duty comes the duty to consult. To not consult = breach of Fiduciary duty. To not consult = breach of Fiduciary duty. Presence of breach? = Fair compensation is needed to keep the Honour and good faith of the Crown. Presence of breach? = Fair compensation is needed to keep the Honour and good faith of the Crown. 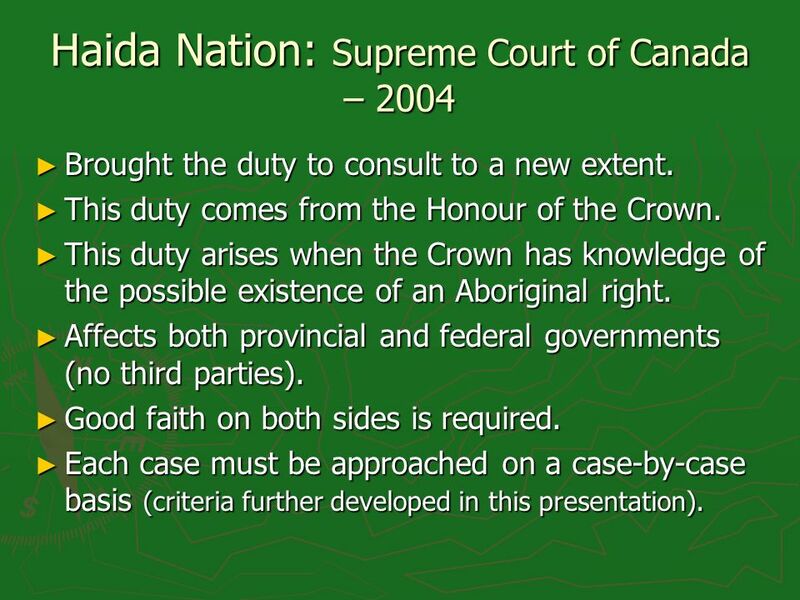 27 Haida Nation: Supreme Court of Canada – 2004 Brought the duty to consult to a new extent. Brought the duty to consult to a new extent. This duty comes from the Honour of the Crown. This duty comes from the Honour of the Crown. This duty arises when the Crown has knowledge of the possible existence of an Aboriginal right. This duty arises when the Crown has knowledge of the possible existence of an Aboriginal right. Affects both provincial and federal governments (no third parties). Affects both provincial and federal governments (no third parties). Good faith on both sides is required. Good faith on both sides is required. Each case must be approached on a case-by-case basis (criteria further developed in this presentation). Each case must be approached on a case-by-case basis (criteria further developed in this presentation). 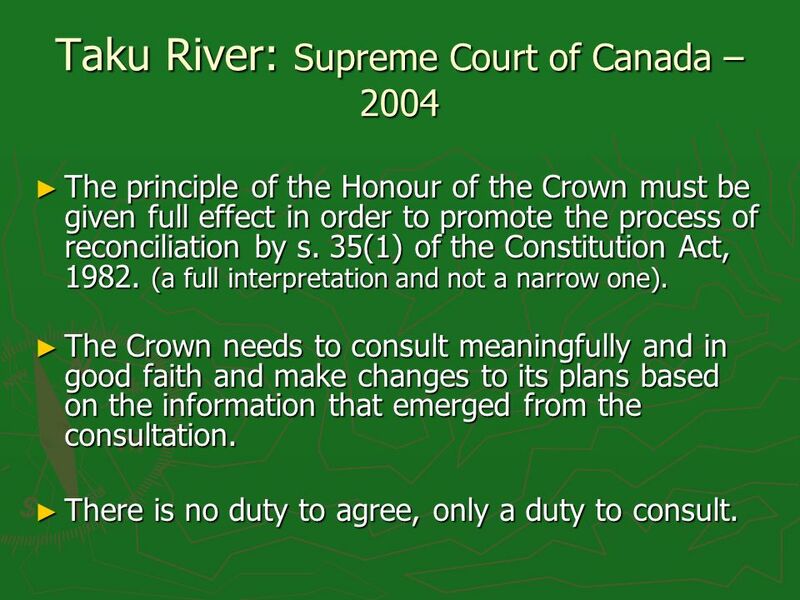 28 Taku River: Supreme Court of Canada – 2004 The principle of the Honour of the Crown must be given full effect in order to promote the process of reconciliation by s. 35(1) of the Constitution Act, 1982. (a full interpretation and not a narrow one). 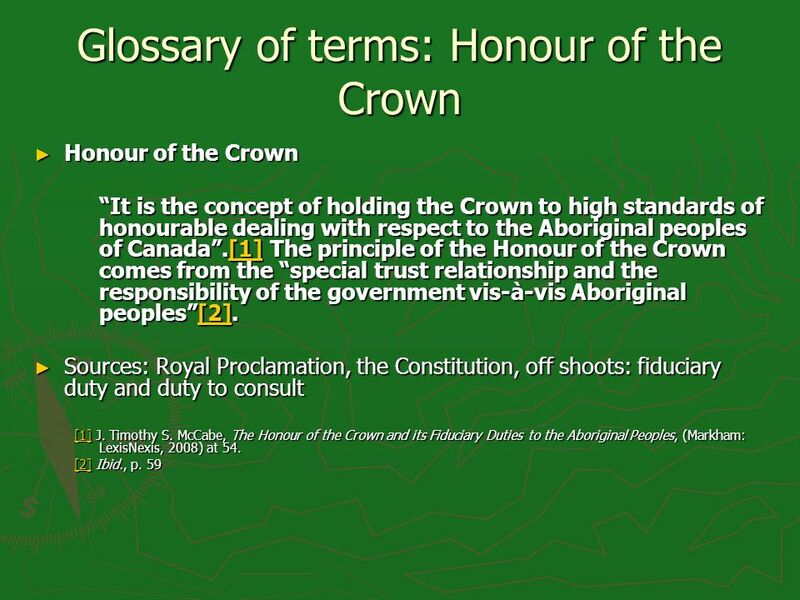 The principle of the Honour of the Crown must be given full effect in order to promote the process of reconciliation by s. 35(1) of the Constitution Act, 1982. (a full interpretation and not a narrow one). The Crown needs to consult meaningfully and in good faith and make changes to its plans based on the information that emerged from the consultation. The Crown needs to consult meaningfully and in good faith and make changes to its plans based on the information that emerged from the consultation. There is no duty to agree, only a duty to consult. There is no duty to agree, only a duty to consult. 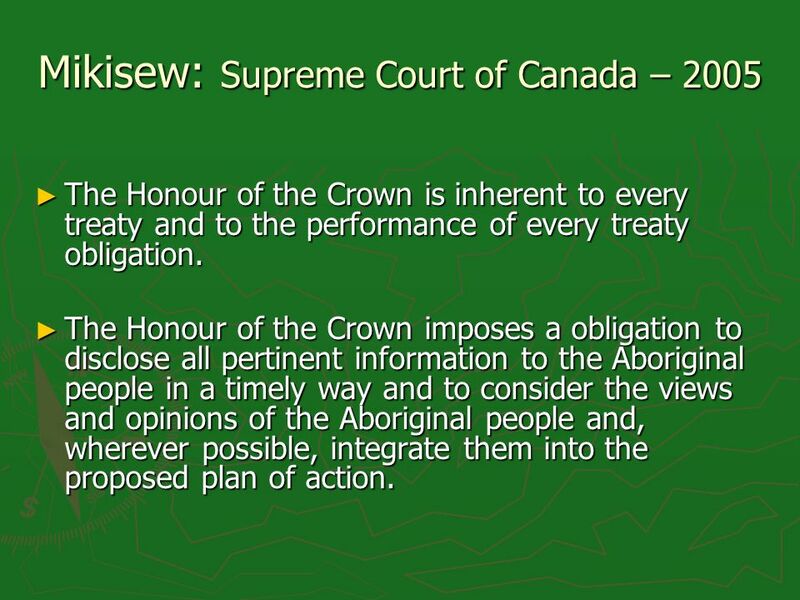 29 Mikisew: Supreme Court of Canada – 2005 The Honour of the Crown is inherent to every treaty and to the performance of every treaty obligation. The Honour of the Crown is inherent to every treaty and to the performance of every treaty obligation. The Honour of the Crown imposes a obligation to disclose all pertinent information to the Aboriginal people in a timely way and to consider the views and opinions of the Aboriginal people and, wherever possible, integrate them into the proposed plan of action. The Honour of the Crown imposes a obligation to disclose all pertinent information to the Aboriginal people in a timely way and to consider the views and opinions of the Aboriginal people and, wherever possible, integrate them into the proposed plan of action. 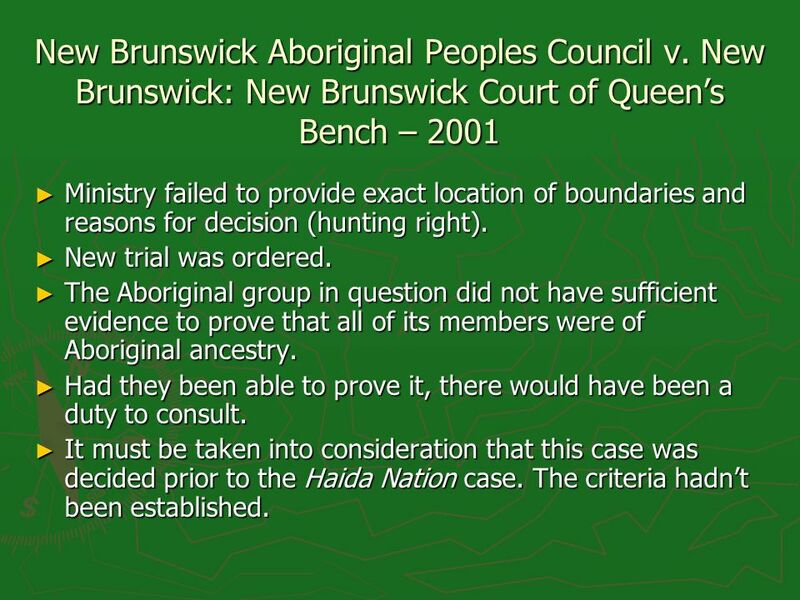 30 New Brunswick Aboriginal Peoples Council v. New Brunswick: New Brunswick Court of Queens Bench – 2001 Ministry failed to provide exact location of boundaries and reasons for decision (hunting right). Ministry failed to provide exact location of boundaries and reasons for decision (hunting right). New trial was ordered. New trial was ordered. The Aboriginal group in question did not have sufficient evidence to prove that all of its members were of Aboriginal ancestry. The Aboriginal group in question did not have sufficient evidence to prove that all of its members were of Aboriginal ancestry. Had they been able to prove it, there would have been a duty to consult. Had they been able to prove it, there would have been a duty to consult. 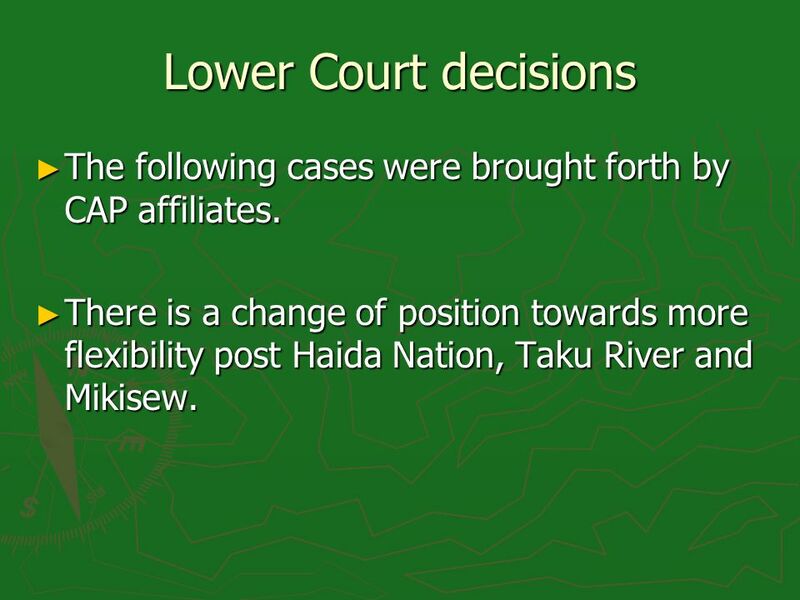 It must be taken into consideration that this case was decided prior to the Haida Nation case. The criteria hadnt been established. It must be taken into consideration that this case was decided prior to the Haida Nation case. The criteria hadnt been established. 31 Lower Court decisions The following cases were brought forth by CAP affiliates. The following cases were brought forth by CAP affiliates. There is a change of position towards more flexibility post Haida Nation, Taku River and Mikisew. There is a change of position towards more flexibility post Haida Nation, Taku River and Mikisew. 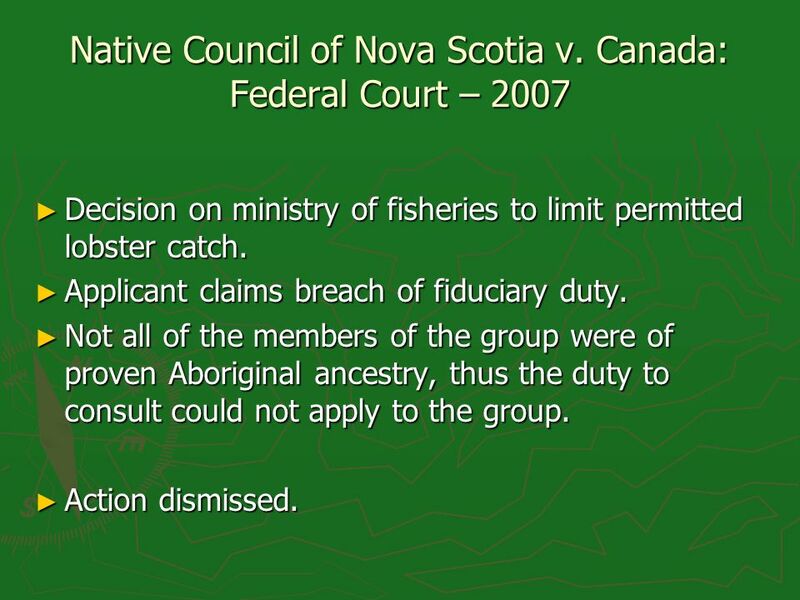 32 Native Council of Nova Scotia v. Canada: Federal Court – 2007 Decision on ministry of fisheries to limit permitted lobster catch. Decision on ministry of fisheries to limit permitted lobster catch. Applicant claims breach of fiduciary duty. Applicant claims breach of fiduciary duty. Not all of the members of the group were of proven Aboriginal ancestry, thus the duty to consult could not apply to the group. Not all of the members of the group were of proven Aboriginal ancestry, thus the duty to consult could not apply to the group. Action dismissed. Action dismissed. 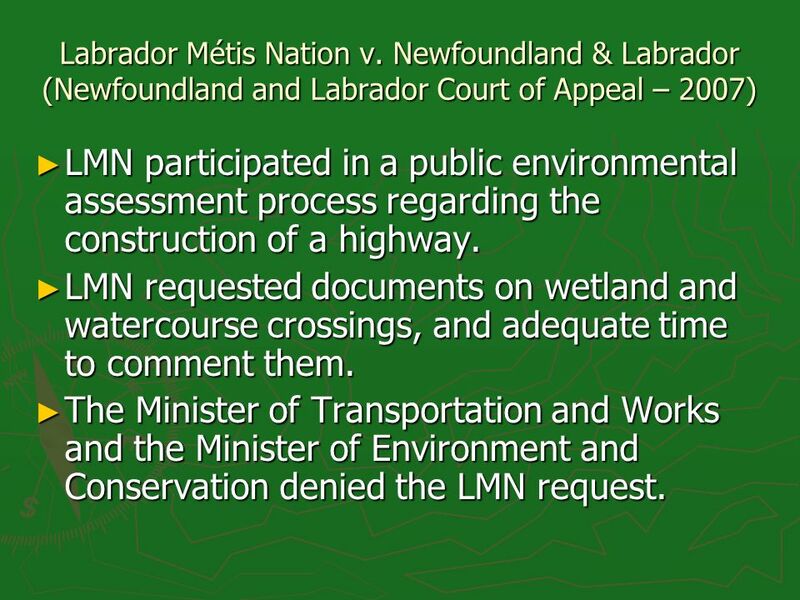 34 Labrador Métis Nation v. Newfoundland & Labrador (Newfoundland and Labrador Court of Appeal – 2007) LMN participated in a public environmental assessment process regarding the construction of a highway. LMN participated in a public environmental assessment process regarding the construction of a highway. LMN requested documents on wetland and watercourse crossings, and adequate time to comment them. LMN requested documents on wetland and watercourse crossings, and adequate time to comment them. The Minister of Transportation and Works and the Minister of Environment and Conservation denied the LMN request. The Minister of Transportation and Works and the Minister of Environment and Conservation denied the LMN request. 35 The court said… The Crown had the duty to consult and accommodate the Métis. It had to provide LMN (Labrador Métis Nation) with the requested documents. The Crown had the duty to consult and accommodate the Métis. It had to provide LMN (Labrador Métis Nation) with the requested documents. 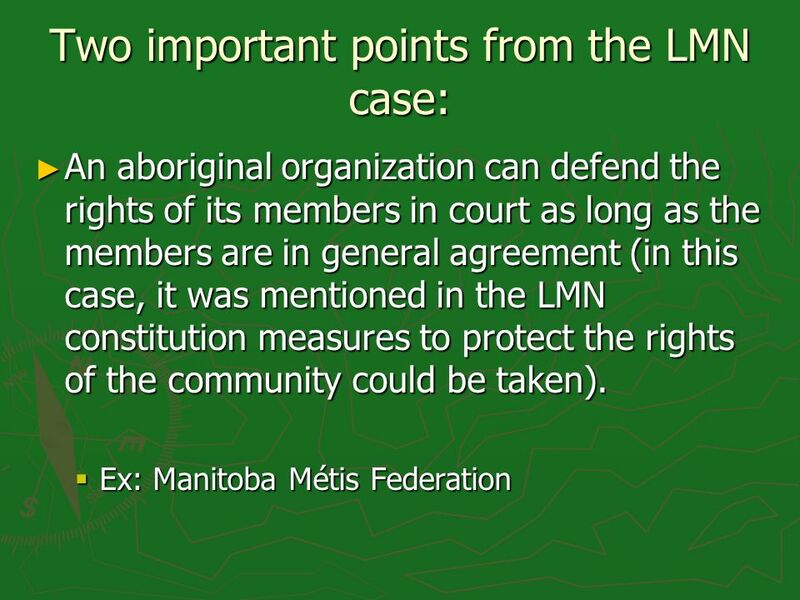 The duty to consult exists regardless of how the LMN identity their members (Inuit or Métis), the trial judge cannot define the identity of an aboriginal group. 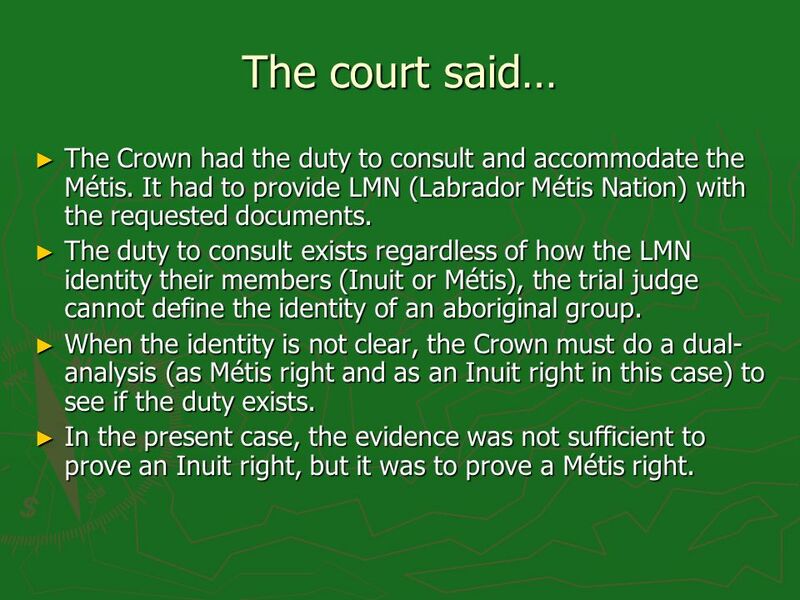 The duty to consult exists regardless of how the LMN identity their members (Inuit or Métis), the trial judge cannot define the identity of an aboriginal group. When the identity is not clear, the Crown must do a dual- analysis (as Métis right and as an Inuit right in this case) to see if the duty exists. When the identity is not clear, the Crown must do a dual- analysis (as Métis right and as an Inuit right in this case) to see if the duty exists. In the present case, the evidence was not sufficient to prove an Inuit right, but it was to prove a Métis right. In the present case, the evidence was not sufficient to prove an Inuit right, but it was to prove a Métis right. 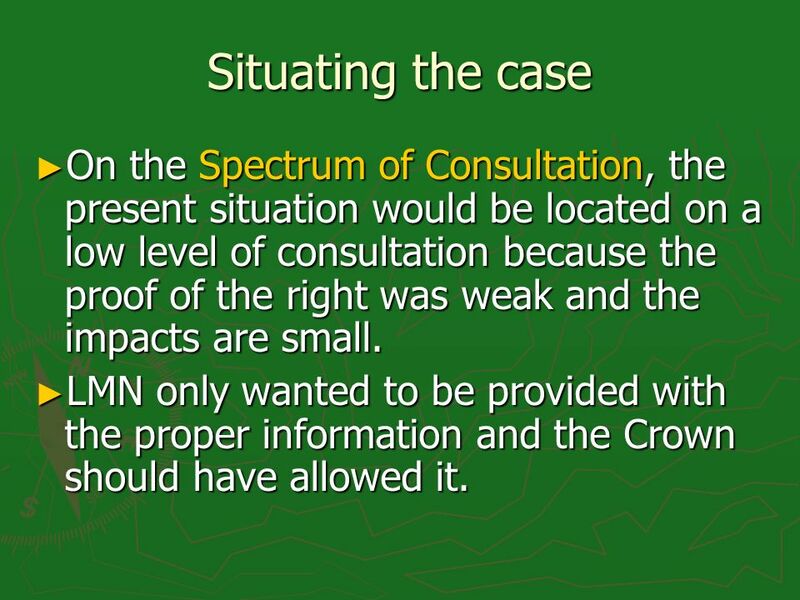 36 Situating the case On the Spectrum of Consultation, the present situation would be located on a low level of consultation because the proof of the right was weak and the impacts are small. 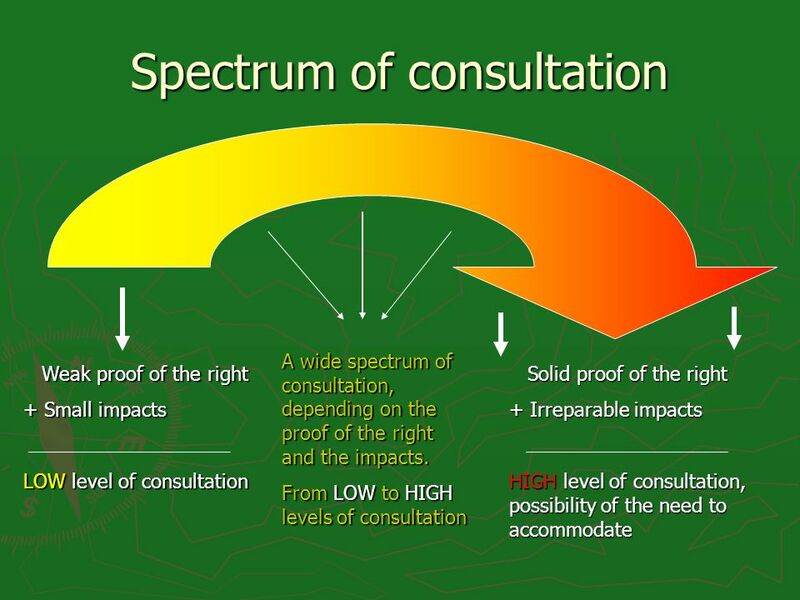 On the Spectrum of Consultation, the present situation would be located on a low level of consultation because the proof of the right was weak and the impacts are small. LMN only wanted to be provided with the proper information and the Crown should have allowed it. LMN only wanted to be provided with the proper information and the Crown should have allowed it. 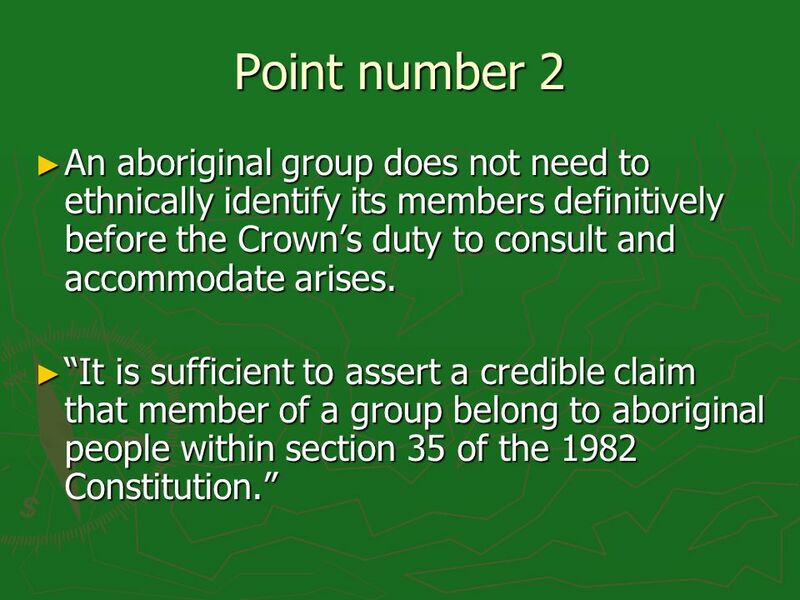 38 Point number 2 An aboriginal group does not need to ethnically identify its members definitively before the Crowns duty to consult and accommodate arises. An aboriginal group does not need to ethnically identify its members definitively before the Crowns duty to consult and accommodate arises. It is sufficient to assert a credible claim that member of a group belong to aboriginal people within section 35 of the 1982 Constitution. It is sufficient to assert a credible claim that member of a group belong to aboriginal people within section 35 of the 1982 Constitution. 39 Impact of decision for future CAP policy position CAP may follow the LMN decision and suggest the government relax the burden of proof in cases of duty to consult. 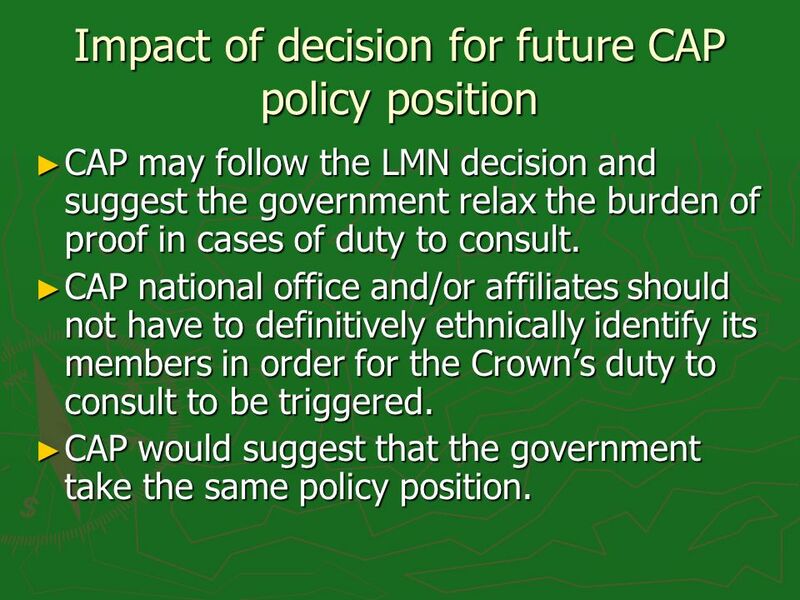 CAP may follow the LMN decision and suggest the government relax the burden of proof in cases of duty to consult. CAP national office and/or affiliates should not have to definitively ethnically identify its members in order for the Crowns duty to consult to be triggered. CAP national office and/or affiliates should not have to definitively ethnically identify its members in order for the Crowns duty to consult to be triggered. CAP would suggest that the government take the same policy position. CAP would suggest that the government take the same policy position. 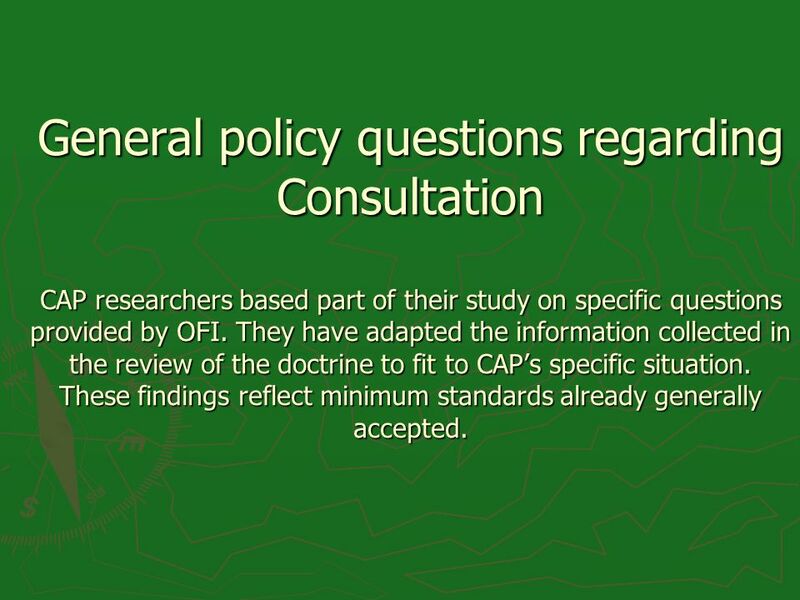 40 General policy questions regarding Consultation CAP researchers based part of their study on specific questions provided by OFI. They have adapted the information collected in the review of the doctrine to fit to CAPs specific situation. These findings reflect minimum standards already generally accepted. 41 What could consultation be from CAPs perspective? 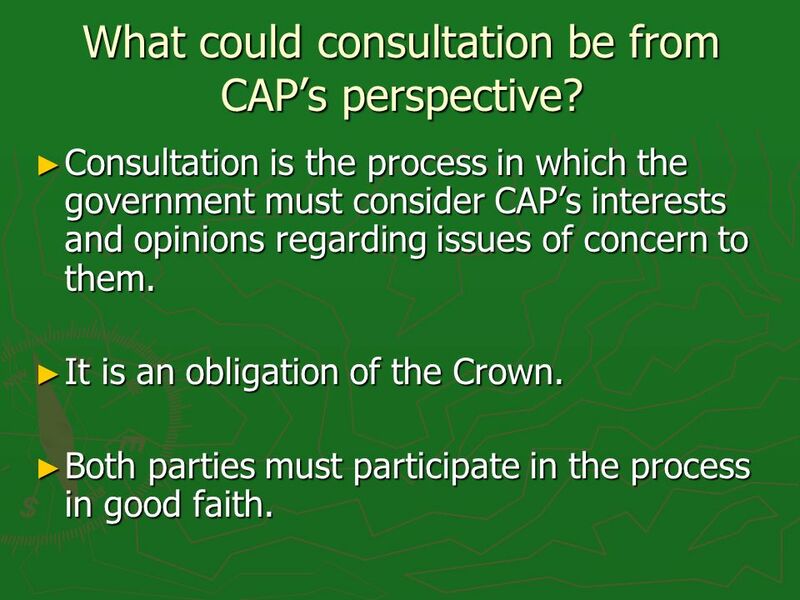 Consultation is the process in which the government must consider CAPs interests and opinions regarding issues of concern to them. 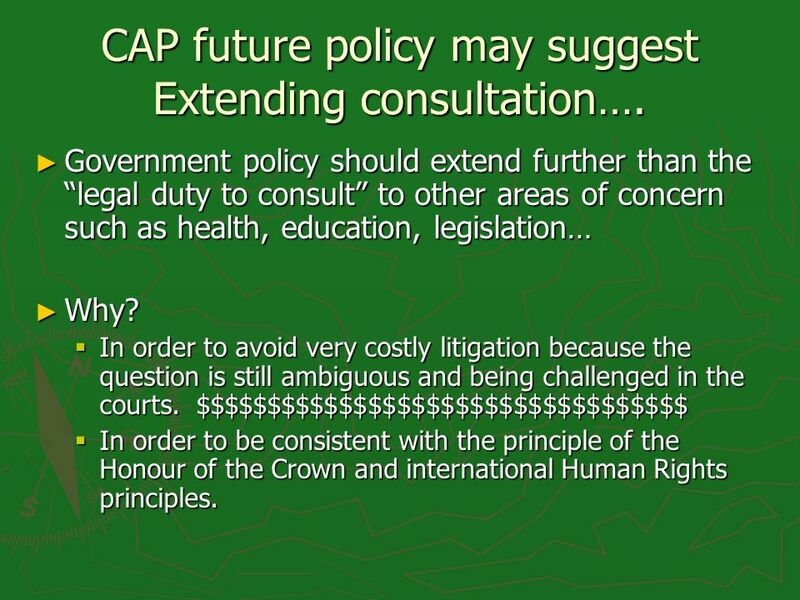 Consultation is the process in which the government must consider CAPs interests and opinions regarding issues of concern to them. It is an obligation of the Crown. It is an obligation of the Crown. Both parties must participate in the process in good faith. Both parties must participate in the process in good faith. 42 What are the generally accepted triggers to the duty to consult? 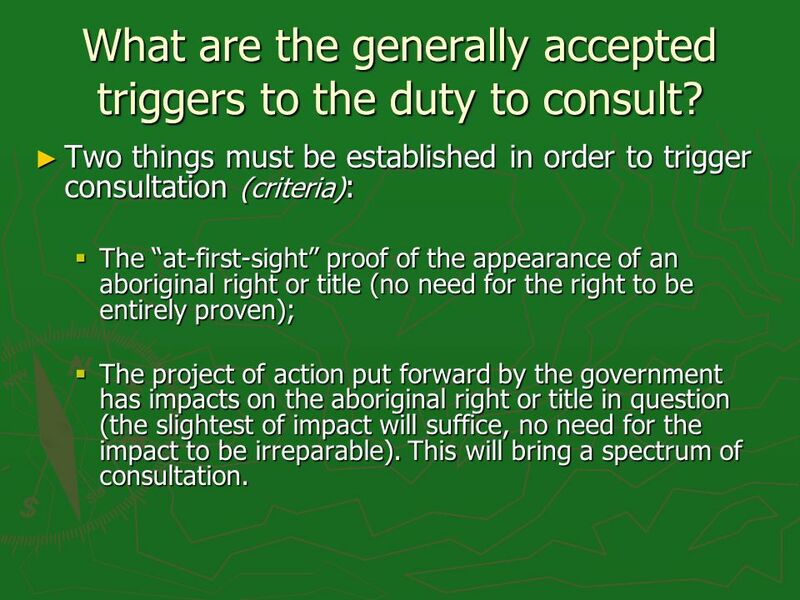 Two things must be established in order to trigger consultation (criteria) : Two things must be established in order to trigger consultation (criteria) : The at-first-sight proof of the appearance of an aboriginal right or title (no need for the right to be entirely proven); The at-first-sight proof of the appearance of an aboriginal right or title (no need for the right to be entirely proven); The project of action put forward by the government has impacts on the aboriginal right or title in question (the slightest of impact will suffice, no need for the impact to be irreparable). This will bring a spectrum of consultation. The project of action put forward by the government has impacts on the aboriginal right or title in question (the slightest of impact will suffice, no need for the impact to be irreparable). This will bring a spectrum of consultation. 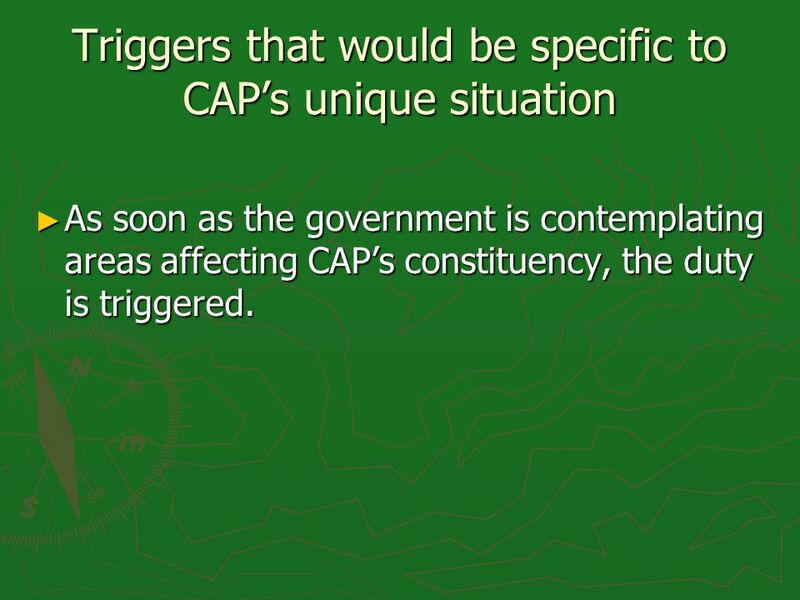 43 Triggers that would be specific to CAPs unique situation As soon as the government is contemplating areas affecting CAPs constituency, the duty is triggered. As soon as the government is contemplating areas affecting CAPs constituency, the duty is triggered. 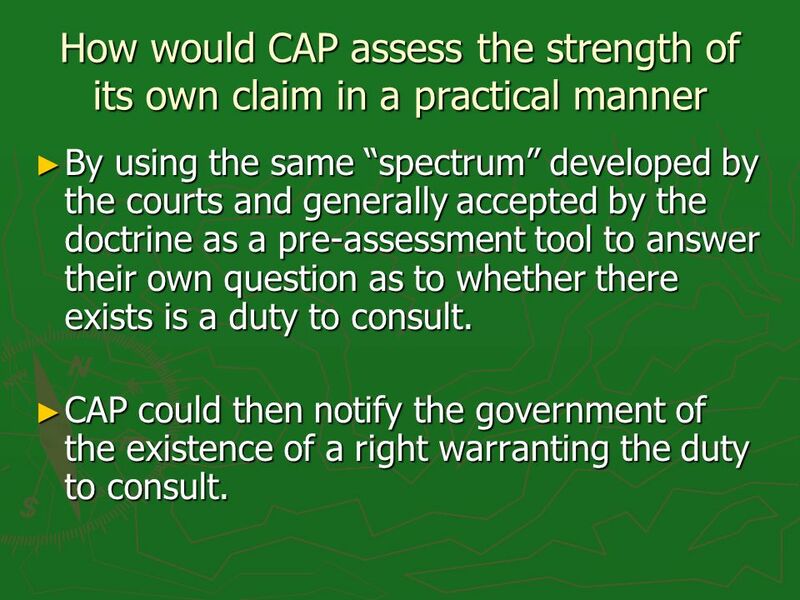 44 How would CAP assess the strength of its own claim in a practical manner By using the same spectrum developed by the courts and generally accepted by the doctrine as a pre-assessment tool to answer their own question as to whether there exists is a duty to consult. By using the same spectrum developed by the courts and generally accepted by the doctrine as a pre-assessment tool to answer their own question as to whether there exists is a duty to consult. CAP could then notify the government of the existence of a right warranting the duty to consult. CAP could then notify the government of the existence of a right warranting the duty to consult. 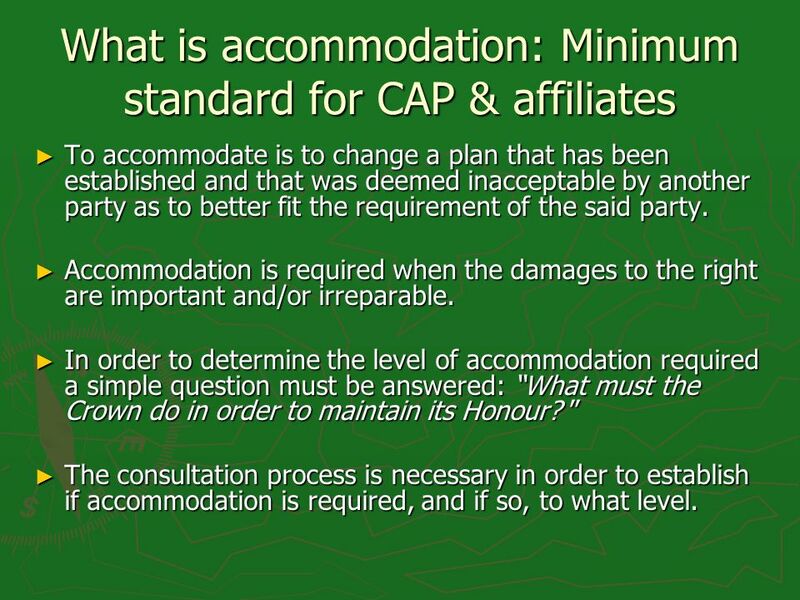 46 What is accommodation: Minimum standard for CAP & affiliates To accommodate is to change a plan that has been established and that was deemed inacceptable by another party as to better fit the requirement of the said party. To accommodate is to change a plan that has been established and that was deemed inacceptable by another party as to better fit the requirement of the said party. Accommodation is required when the damages to the right are important and/or irreparable. Accommodation is required when the damages to the right are important and/or irreparable. In order to determine the level of accommodation required a simple question must be answered: What must the Crown do in order to maintain its Honour? In order to determine the level of accommodation required a simple question must be answered: What must the Crown do in order to maintain its Honour? The consultation process is necessary in order to establish if accommodation is required, and if so, to what level. The consultation process is necessary in order to establish if accommodation is required, and if so, to what level. 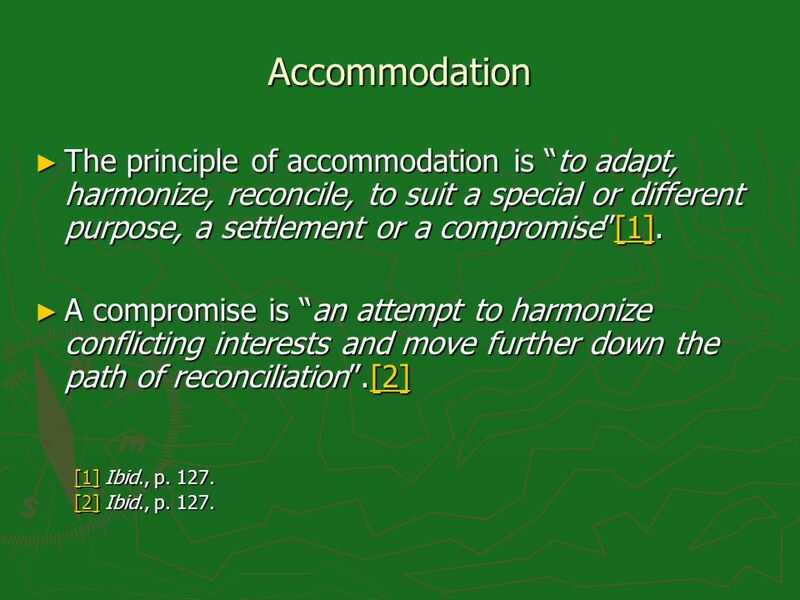 47 When can accommodation be expected? Once again depending on the importance of the impacts, accommodation might require more from the government. Once again depending on the importance of the impacts, accommodation might require more from the government. Ex: if the project in question is the construction of a road, the government might bring modifications to the plan and change the location of the road. If the road cannot be relocated, the government will have to give financial compensation to the Aboriginal people. Ex: if the project in question is the construction of a road, the government might bring modifications to the plan and change the location of the road. If the road cannot be relocated, the government will have to give financial compensation to the Aboriginal people. 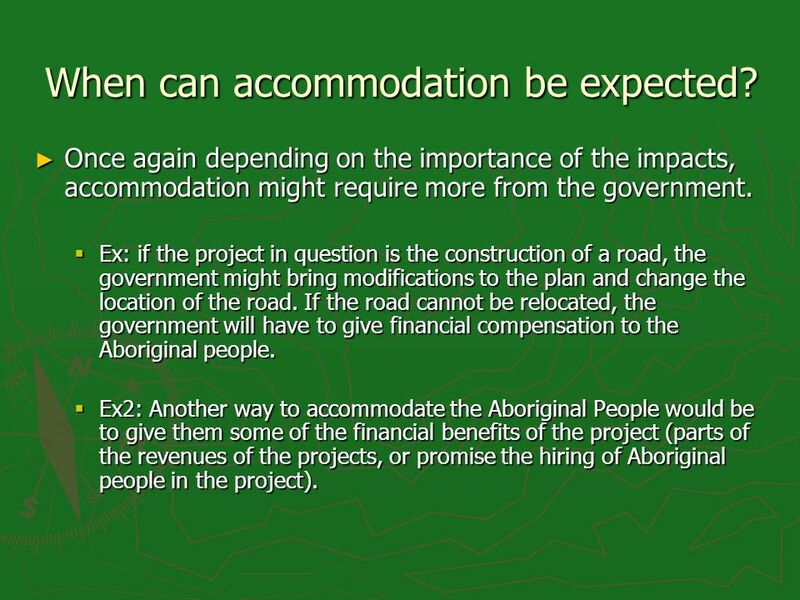 Ex2: Another way to accommodate the Aboriginal People would be to give them some of the financial benefits of the project (parts of the revenues of the projects, or promise the hiring of Aboriginal people in the project). 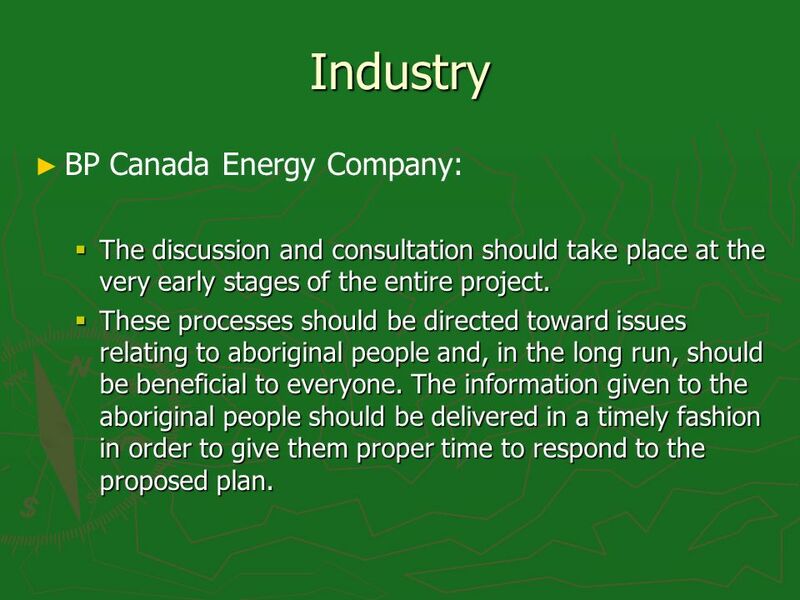 Ex2: Another way to accommodate the Aboriginal People would be to give them some of the financial benefits of the project (parts of the revenues of the projects, or promise the hiring of Aboriginal people in the project). 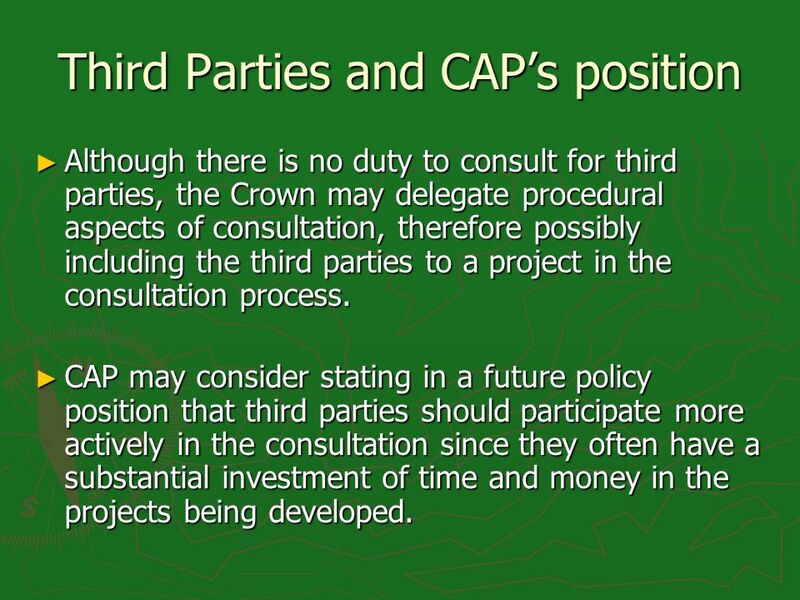 48 Third Parties and CAPs position Although there is no duty to consult for third parties, the Crown may delegate procedural aspects of consultation, therefore possibly including the third parties to a project in the consultation process. 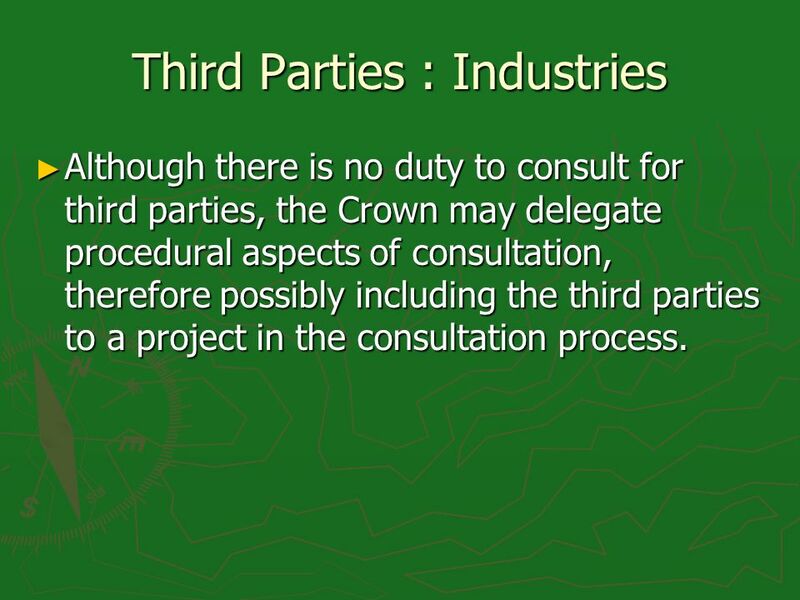 Although there is no duty to consult for third parties, the Crown may delegate procedural aspects of consultation, therefore possibly including the third parties to a project in the consultation process. CAP may consider stating in a future policy position that third parties should participate more actively in the consultation since they often have a substantial investment of time and money in the projects being developed. CAP may consider stating in a future policy position that third parties should participate more actively in the consultation since they often have a substantial investment of time and money in the projects being developed. 49 What is capacity and what are the policy implications for CAP? 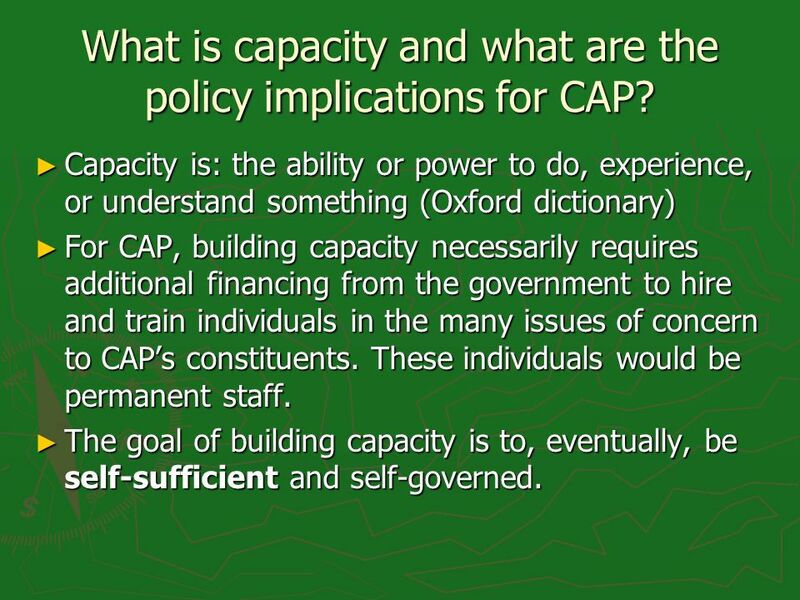 Capacity is: the ability or power to do, experience, or understand something (Oxford dictionary) Capacity is: the ability or power to do, experience, or understand something (Oxford dictionary) For CAP, building capacity necessarily requires additional financing from the government to hire and train individuals in the many issues of concern to CAPs constituents. These individuals would be permanent staff. For CAP, building capacity necessarily requires additional financing from the government to hire and train individuals in the many issues of concern to CAPs constituents. These individuals would be permanent staff. The goal of building capacity is to, eventually, be self-sufficient and self-governed. The goal of building capacity is to, eventually, be self-sufficient and self-governed. 50 What advantages could capacity bring to CAP? Long-term capacity: Long-term capacity: Provides beneficial tools for CAP for a long period of time (as opposed to the short-term capacity which provides the tools for one consultation process only) Provides beneficial tools for CAP for a long period of time (as opposed to the short-term capacity which provides the tools for one consultation process only) Lightens the procedural steps leading to the actual consultation (because CAP will not have to ask the government for funds in order to finance each and every new consultation process. 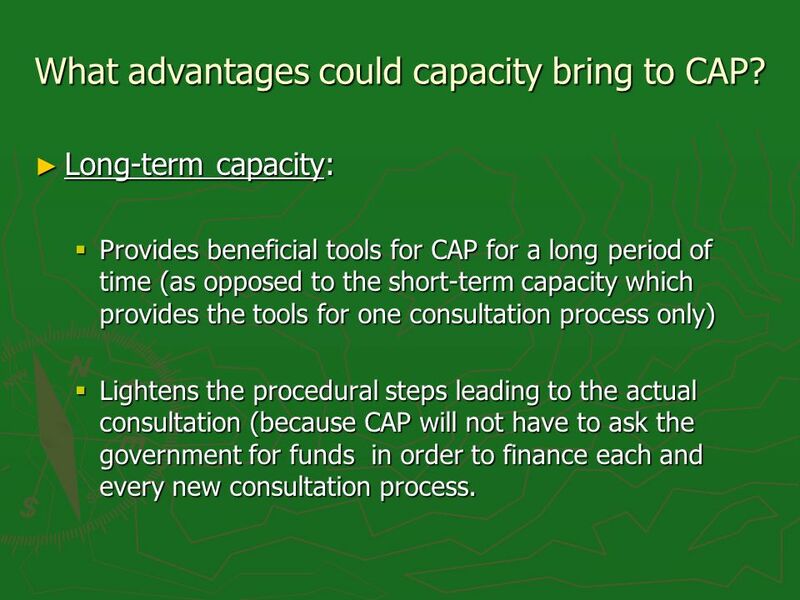 Lightens the procedural steps leading to the actual consultation (because CAP will not have to ask the government for funds in order to finance each and every new consultation process. 51 Capacity - example A project requires the hiring of an anthropologist. 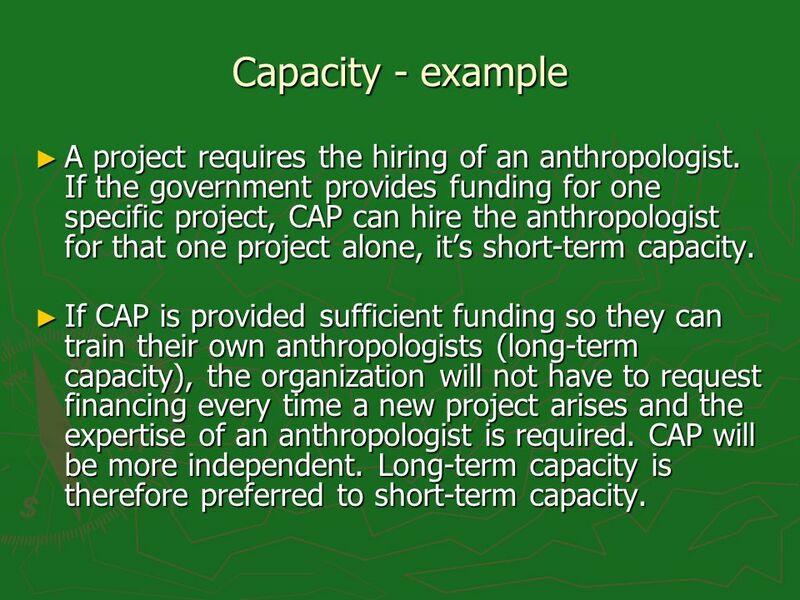 If the government provides funding for one specific project, CAP can hire the anthropologist for that one project alone, its short-term capacity. A project requires the hiring of an anthropologist. If the government provides funding for one specific project, CAP can hire the anthropologist for that one project alone, its short-term capacity. If CAP is provided sufficient funding so they can train their own anthropologists (long-term capacity), the organization will not have to request financing every time a new project arises and the expertise of an anthropologist is required. CAP will be more independent. Long-term capacity is therefore preferred to short-term capacity. If CAP is provided sufficient funding so they can train their own anthropologists (long-term capacity), the organization will not have to request financing every time a new project arises and the expertise of an anthropologist is required. CAP will be more independent. Long-term capacity is therefore preferred to short-term capacity. 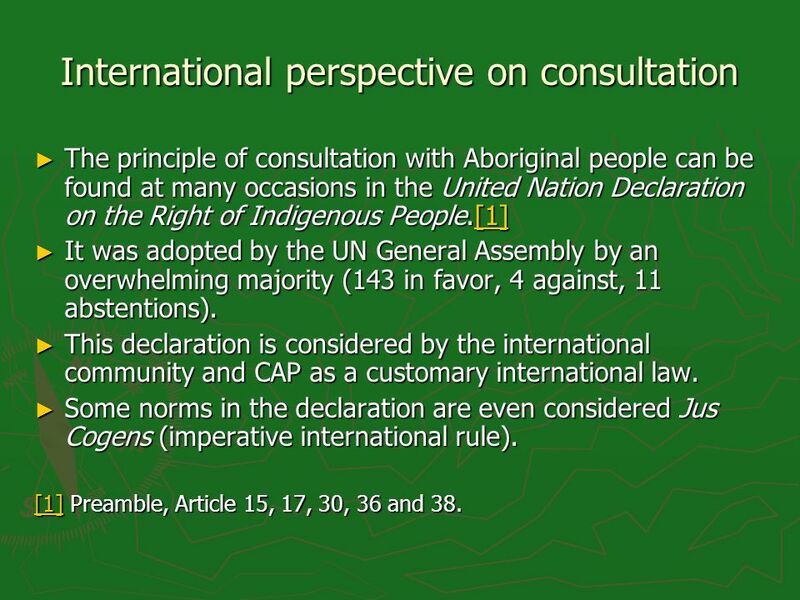 53 ILO 169 and Human Rights: James Anaya (Royal Commission on Aboriginal Peoples) The normative parameters of the duty to consult are found in international standards including the IL0 Convention No. 169. The normative parameters of the duty to consult are found in international standards including the IL0 Convention No. 169. 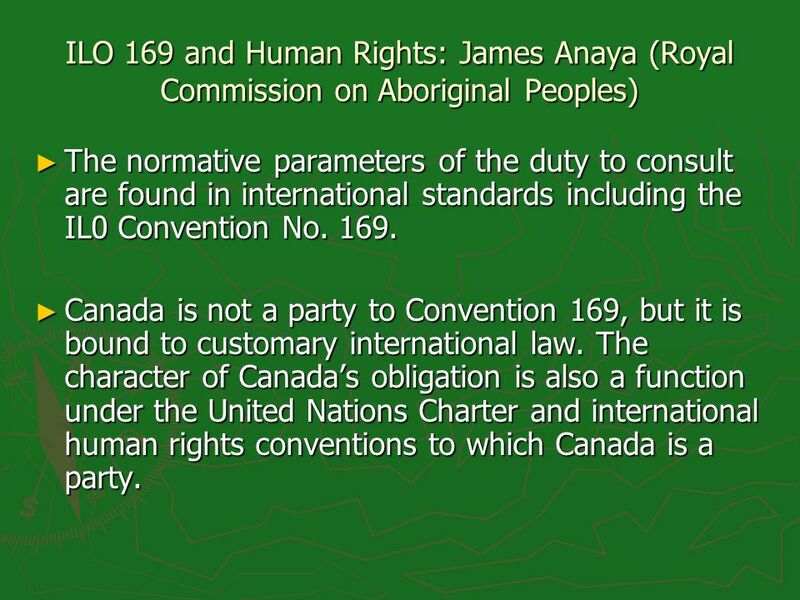 Canada is not a party to Convention 169, but it is bound to customary international law. The character of Canadas obligation is also a function under the United Nations Charter and international human rights conventions to which Canada is a party. Canada is not a party to Convention 169, but it is bound to customary international law. The character of Canadas obligation is also a function under the United Nations Charter and international human rights conventions to which Canada is a party. 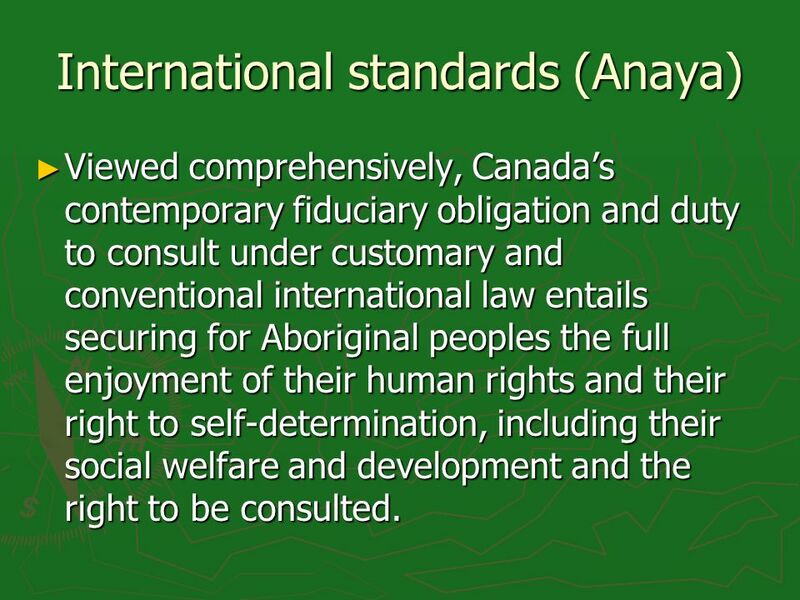 54 International standards (Anaya) Viewed comprehensively, Canadas contemporary fiduciary obligation and duty to consult under customary and conventional international law entails securing for Aboriginal peoples the full enjoyment of their human rights and their right to self-determination, including their social welfare and development and the right to be consulted. 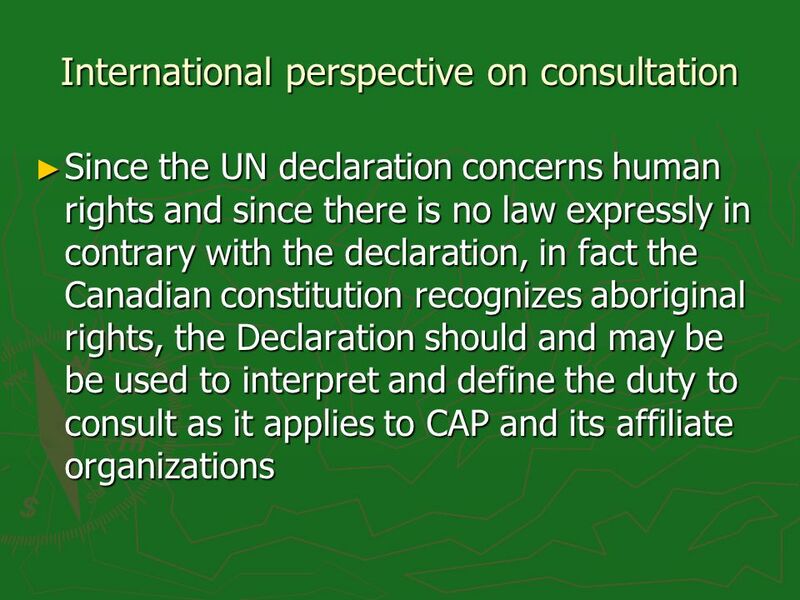 Viewed comprehensively, Canadas contemporary fiduciary obligation and duty to consult under customary and conventional international law entails securing for Aboriginal peoples the full enjoyment of their human rights and their right to self-determination, including their social welfare and development and the right to be consulted. 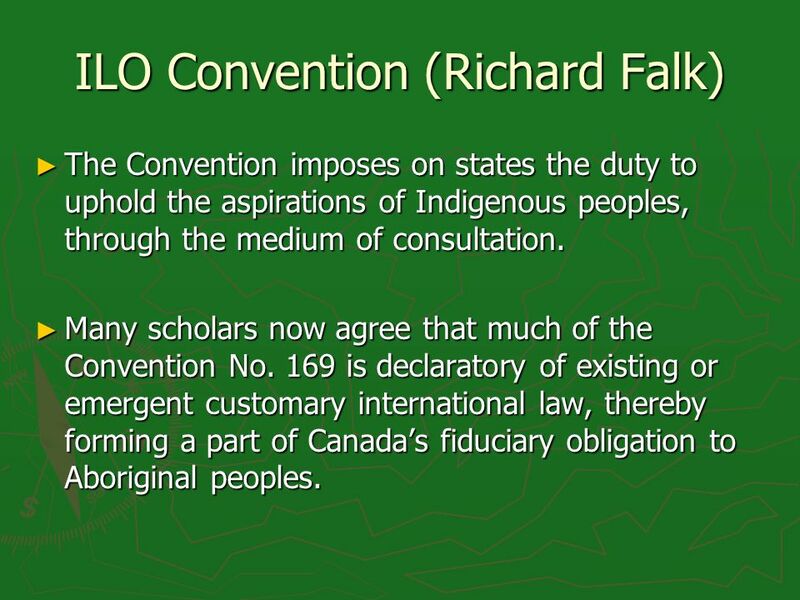 55 ILO Convention (Richard Falk) The Convention imposes on states the duty to uphold the aspirations of Indigenous peoples, through the medium of consultation. The Convention imposes on states the duty to uphold the aspirations of Indigenous peoples, through the medium of consultation. Many scholars now agree that much of the Convention No. 169 is declaratory of existing or emergent customary international law, thereby forming a part of Canadas fiduciary obligation to Aboriginal peoples. Many scholars now agree that much of the Convention No. 169 is declaratory of existing or emergent customary international law, thereby forming a part of Canadas fiduciary obligation to Aboriginal peoples. 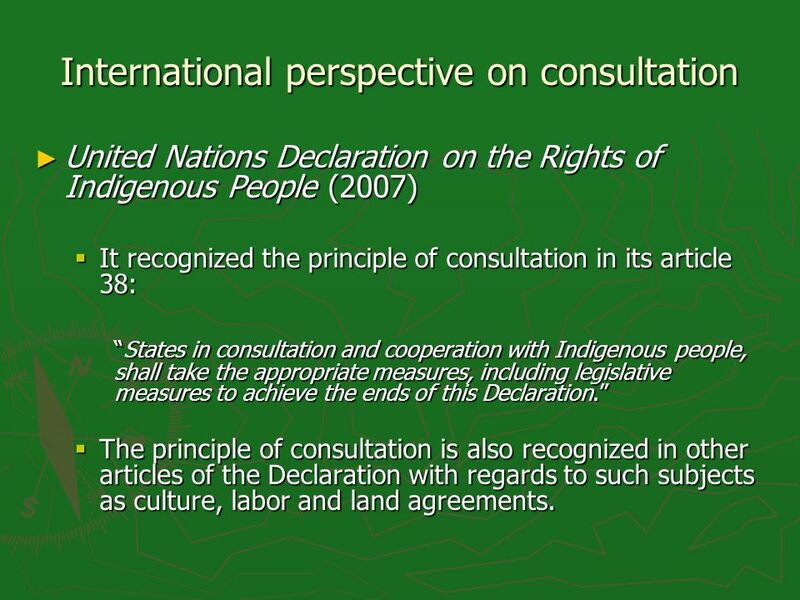 56 International perspective on consultation United Nations Declaration on the Rights of Indigenous People (2007) United Nations Declaration on the Rights of Indigenous People (2007) It recognized the principle of consultation in its article 38: It recognized the principle of consultation in its article 38: States in consultation and cooperation with Indigenous people, shall take the appropriate measures, including legislative measures to achieve the ends of this Declaration.States in consultation and cooperation with Indigenous people, shall take the appropriate measures, including legislative measures to achieve the ends of this Declaration. The principle of consultation is also recognized in other articles of the Declaration with regards to such subjects as culture, labor and land agreements. The principle of consultation is also recognized in other articles of the Declaration with regards to such subjects as culture, labor and land agreements. 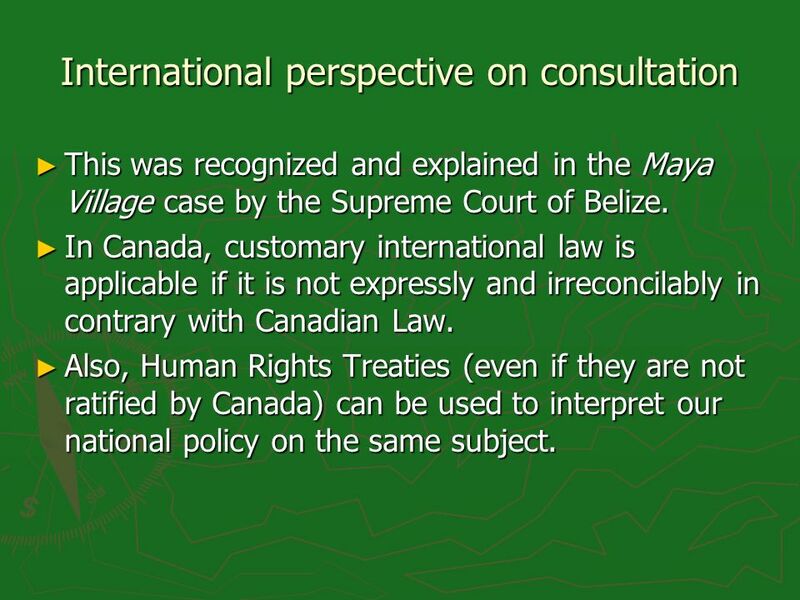 58 International perspective on consultation This was recognized and explained in the Maya Village case by the Supreme Court of Belize. This was recognized and explained in the Maya Village case by the Supreme Court of Belize. In Canada, customary international law is applicable if it is not expressly and irreconcilably in contrary with Canadian Law. In Canada, customary international law is applicable if it is not expressly and irreconcilably in contrary with Canadian Law. Also, Human Rights Treaties (even if they are not ratified by Canada) can be used to interpret our national policy on the same subject. Also, Human Rights Treaties (even if they are not ratified by Canada) can be used to interpret our national policy on the same subject. 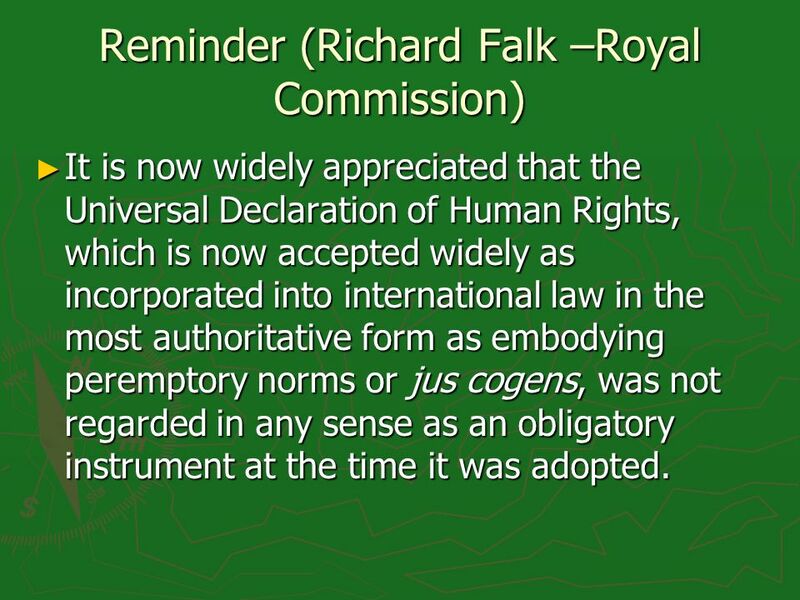 60 Reminder (Richard Falk –Royal Commission) It is now widely appreciated that the Universal Declaration of Human Rights, which is now accepted widely as incorporated into international law in the most authoritative form as embodying peremptory norms or jus cogens, was not regarded in any sense as an obligatory instrument at the time it was adopted. It is now widely appreciated that the Universal Declaration of Human Rights, which is now accepted widely as incorporated into international law in the most authoritative form as embodying peremptory norms or jus cogens, was not regarded in any sense as an obligatory instrument at the time it was adopted. 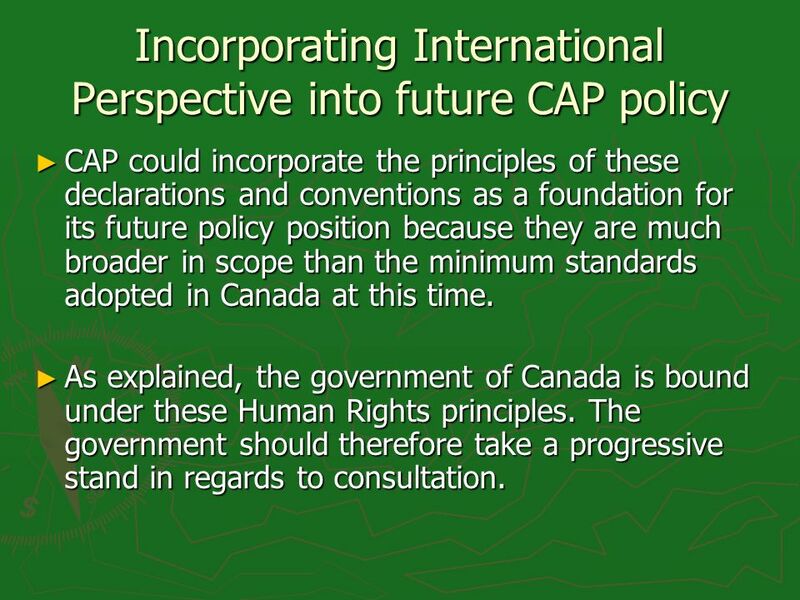 61 Incorporating International Perspective into future CAP policy CAP could incorporate the principles of these declarations and conventions as a foundation for its future policy position because they are much broader in scope than the minimum standards adopted in Canada at this time. CAP could incorporate the principles of these declarations and conventions as a foundation for its future policy position because they are much broader in scope than the minimum standards adopted in Canada at this time. As explained, the government of Canada is bound under these Human Rights principles. The government should therefore take a progressive stand in regards to consultation. As explained, the government of Canada is bound under these Human Rights principles. The government should therefore take a progressive stand in regards to consultation. 64 Federal Government policy : Points of importance to CAP The Crown should remember that political organizations are not necessarily the rights holders although they may be authorized to speak on behalf of them. The Crown should remember that political organizations are not necessarily the rights holders although they may be authorized to speak on behalf of them. 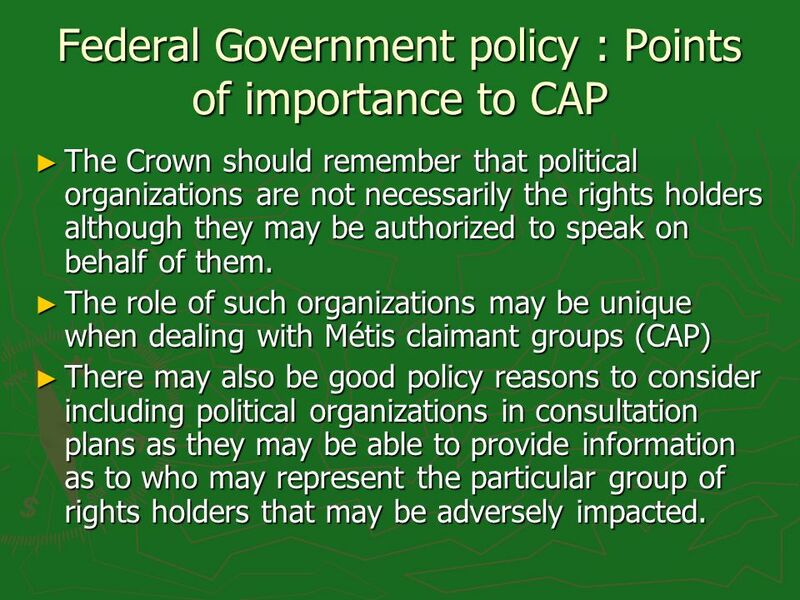 The role of such organizations may be unique when dealing with Métis claimant groups (CAP) The role of such organizations may be unique when dealing with Métis claimant groups (CAP) There may also be good policy reasons to consider including political organizations in consultation plans as they may be able to provide information as to who may represent the particular group of rights holders that may be adversely impacted. There may also be good policy reasons to consider including political organizations in consultation plans as they may be able to provide information as to who may represent the particular group of rights holders that may be adversely impacted. 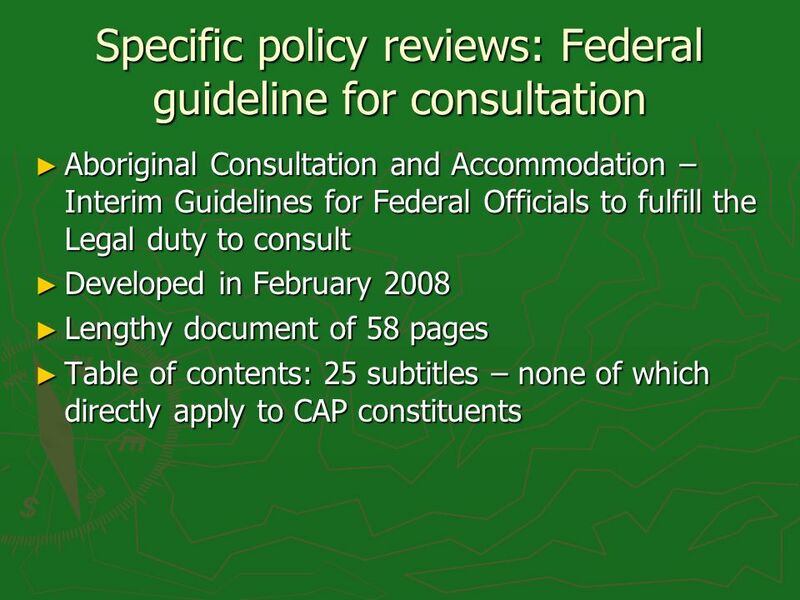 65 Policy for Off-reserve consultations Although the federal policy speaks of aboriginal organizations, the words off-reserve are nowhere to be found in the document. Although the federal policy speaks of aboriginal organizations, the words off-reserve are nowhere to be found in the document. This is a serious lacuna that needs to be addressed. Off-reserve should not be excluded This is a serious lacuna that needs to be addressed. Off-reserve should not be excluded Why? Corbière principles: off-reserve residency is an analogous prohibited ground of discrimination to those listed in s. 15(1) of the Charter. Why? 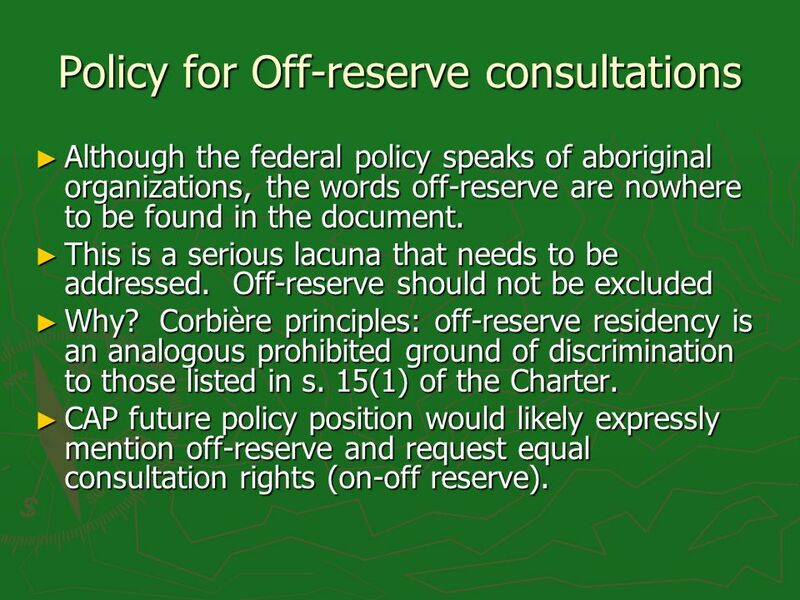 Corbière principles: off-reserve residency is an analogous prohibited ground of discrimination to those listed in s. 15(1) of the Charter. CAP future policy position would likely expressly mention off-reserve and request equal consultation rights (on-off reserve). CAP future policy position would likely expressly mention off-reserve and request equal consultation rights (on-off reserve). 66 More policy needed… The federal government could develop a separate detailed policy with respect to off- reserve, non-status and Métis as their needs are unique and different from the other groups mentioned in s. 35 of the Constitution. 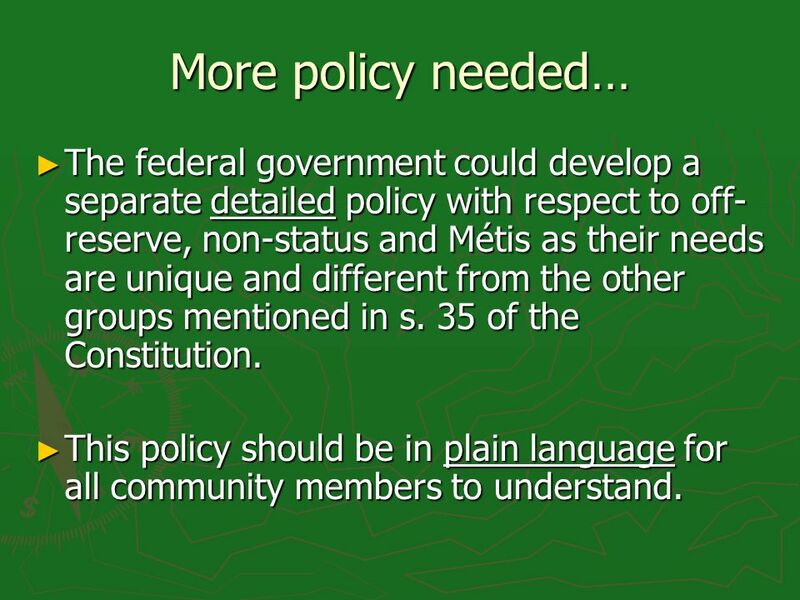 The federal government could develop a separate detailed policy with respect to off- reserve, non-status and Métis as their needs are unique and different from the other groups mentioned in s. 35 of the Constitution. This policy should be in plain language for all community members to understand. This policy should be in plain language for all community members to understand. 67 CAP future policy may suggest Extending consultation…. Government policy should extend further than the legal duty to consult to other areas of concern such as health, education, legislation… Government policy should extend further than the legal duty to consult to other areas of concern such as health, education, legislation… Why? Why? In order to avoid very costly litigation because the question is still ambiguous and being challenged in the courts. $$$$$$$$$$$$$$$$$$$$$$$$$$$$$$$$$$ In order to avoid very costly litigation because the question is still ambiguous and being challenged in the courts. $$$$$$$$$$$$$$$$$$$$$$$$$$$$$$$$$$ In order to be consistent with the principle of the Honour of the Crown and international Human Rights principles. In order to be consistent with the principle of the Honour of the Crown and international Human Rights principles. 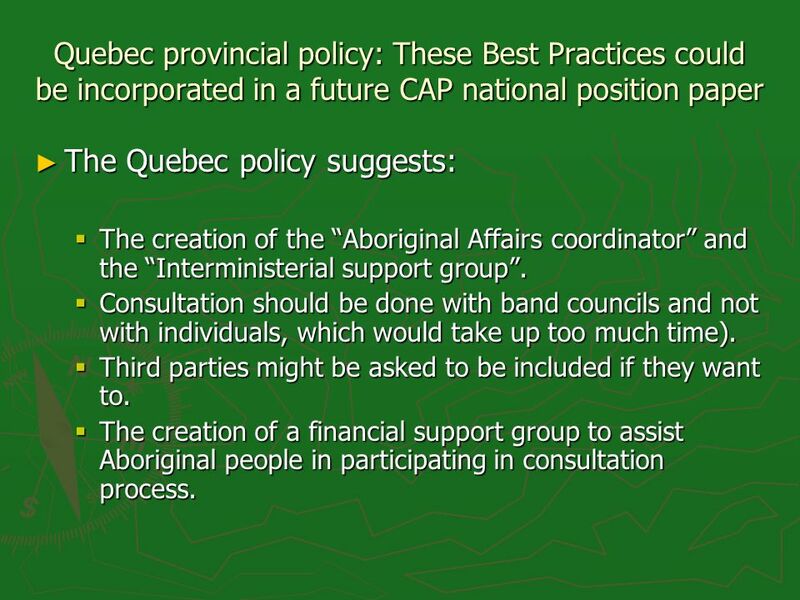 68 Quebec provincial policy: These Best Practices could be incorporated in a future CAP national position paper The Quebec policy suggests: The Quebec policy suggests: The creation of the Aboriginal Affairs coordinator and the Interministerial support group. The creation of the Aboriginal Affairs coordinator and the Interministerial support group. Consultation should be done with band councils and not with individuals, which would take up too much time). Consultation should be done with band councils and not with individuals, which would take up too much time). Third parties might be asked to be included if they want to. Third parties might be asked to be included if they want to. The creation of a financial support group to assist Aboriginal people in participating in consultation process. The creation of a financial support group to assist Aboriginal people in participating in consultation process. 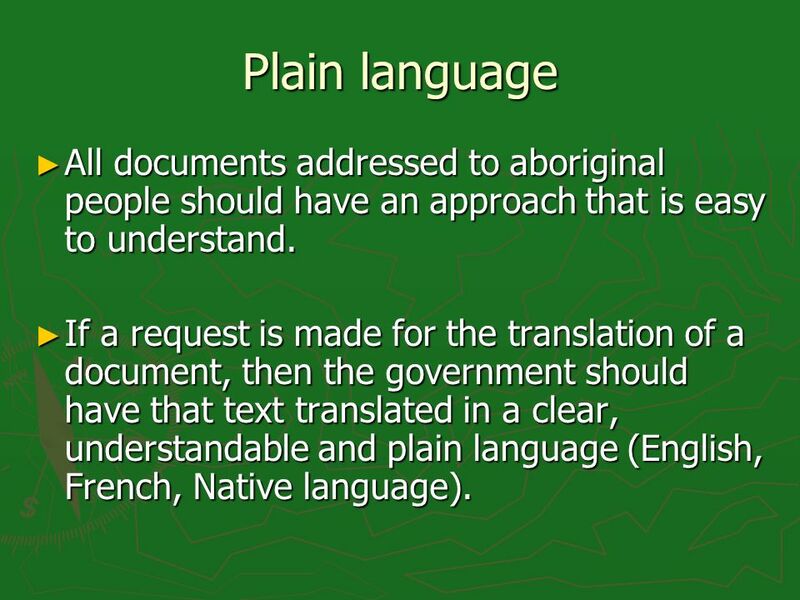 69 Plain language All documents addressed to aboriginal people should have an approach that is easy to understand. 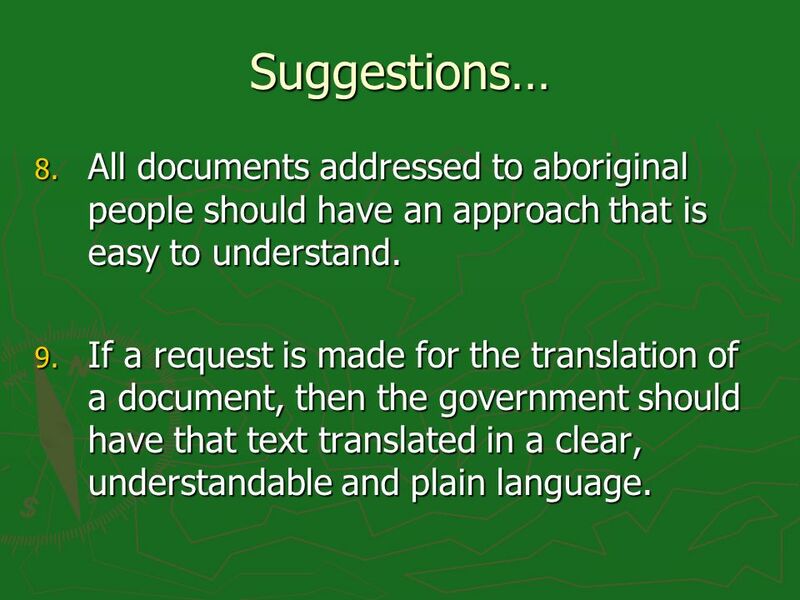 All documents addressed to aboriginal people should have an approach that is easy to understand. If a request is made for the translation of a document, then the government should have that text translated in a clear, understandable and plain language (English, French, Native language). If a request is made for the translation of a document, then the government should have that text translated in a clear, understandable and plain language (English, French, Native language). 70 Living near a reserve Finally, one of the criteria for the right to consultation is, as the government states, living near a reserve. 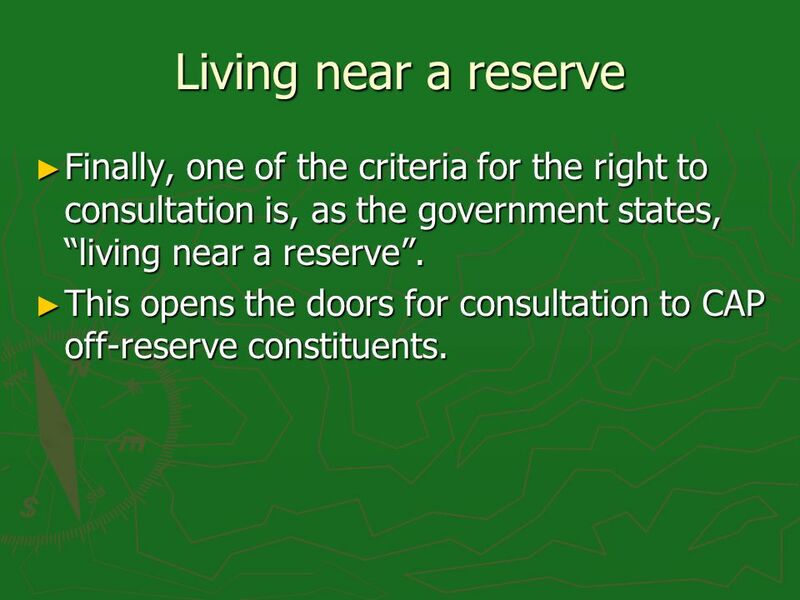 Finally, one of the criteria for the right to consultation is, as the government states, living near a reserve. This opens the doors for consultation to CAP off-reserve constituents. This opens the doors for consultation to CAP off-reserve constituents. 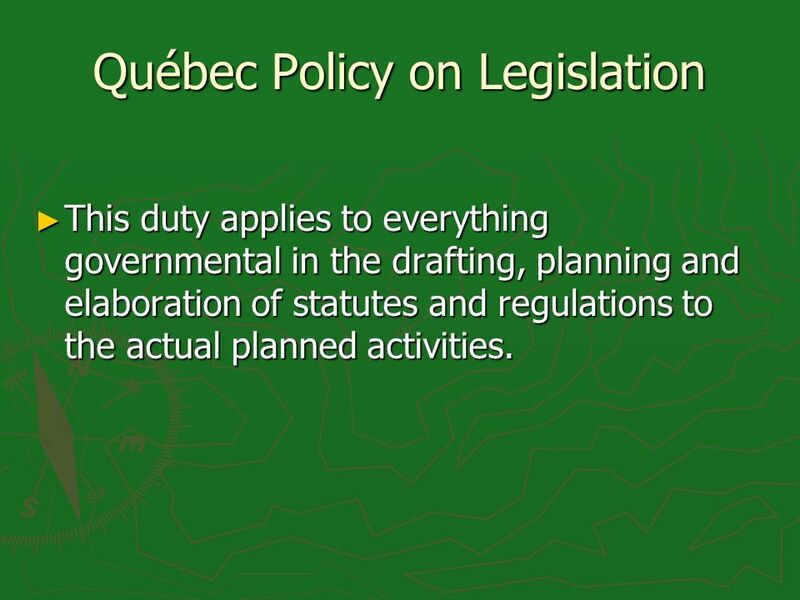 71 Québec Policy on Legislation This duty applies to everything governmental in the drafting, planning and elaboration of statutes and regulations to the actual planned activities. This duty applies to everything governmental in the drafting, planning and elaboration of statutes and regulations to the actual planned activities. 72 Applying Québec Policy to CAPs Perspective The Québec Policy on consultation reflects the international perspective presented earlier, and CAP could incorporate the requirement of proper consultation on legislation into their future policy. The Québec Policy on consultation reflects the international perspective presented earlier, and CAP could incorporate the requirement of proper consultation on legislation into their future policy. 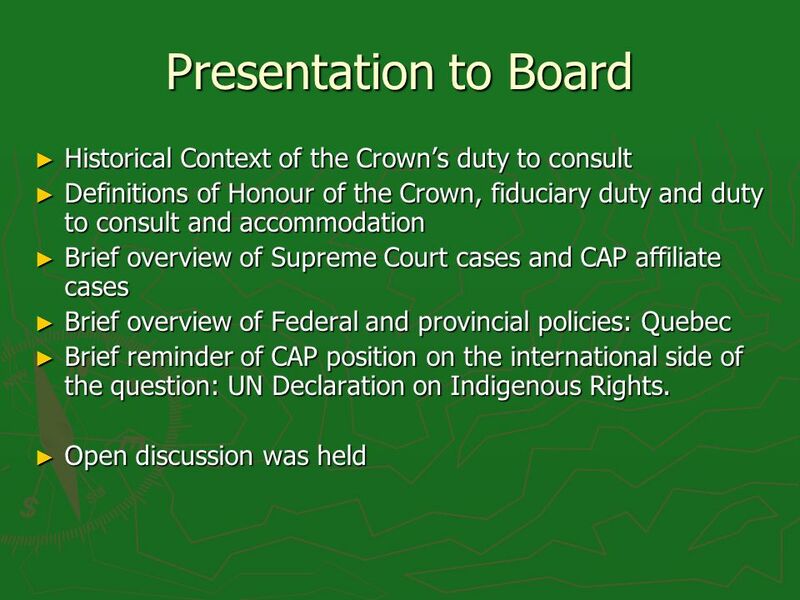 Example: CAP and affiliates should be consulted on new legislation to replace section 6 of the Indian Act that defines who is an Indian (McIvor decision). 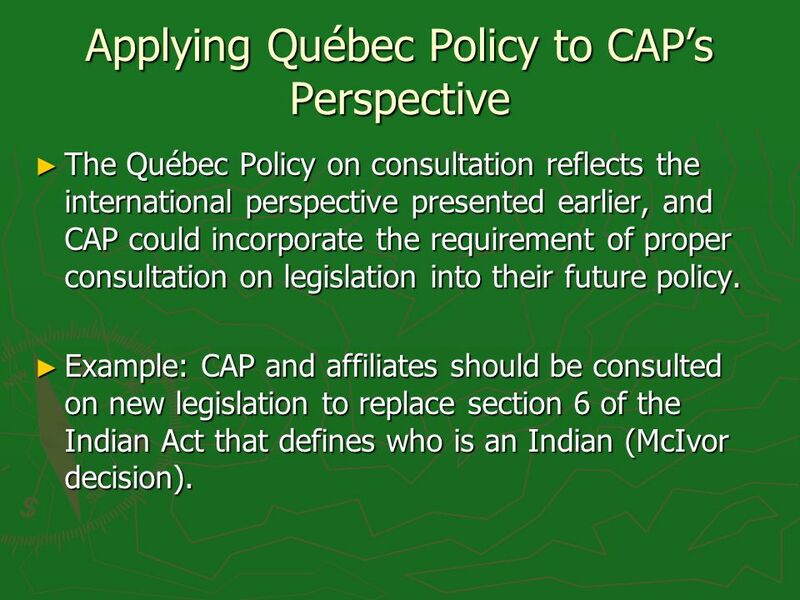 Example: CAP and affiliates should be consulted on new legislation to replace section 6 of the Indian Act that defines who is an Indian (McIvor decision). 73 Third Parties : Industries Although there is no duty to consult for third parties, the Crown may delegate procedural aspects of consultation, therefore possibly including the third parties to a project in the consultation process. Although there is no duty to consult for third parties, the Crown may delegate procedural aspects of consultation, therefore possibly including the third parties to a project in the consultation process. 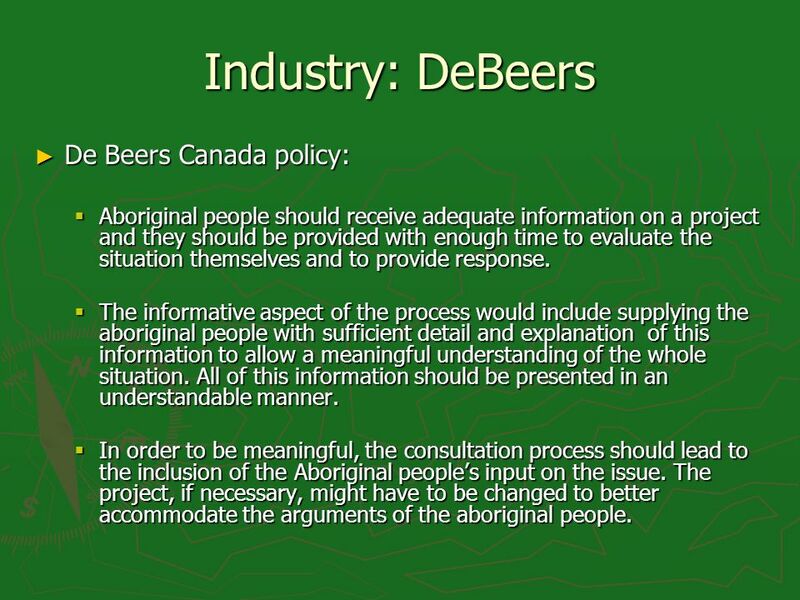 74 Industry: DeBeers De Beers Canada policy: De Beers Canada policy: Aboriginal people should receive adequate information on a project and they should be provided with enough time to evaluate the situation themselves and to provide response. Aboriginal people should receive adequate information on a project and they should be provided with enough time to evaluate the situation themselves and to provide response. The informative aspect of the process would include supplying the aboriginal people with sufficient detail and explanation of this information to allow a meaningful understanding of the whole situation. All of this information should be presented in an understandable manner. 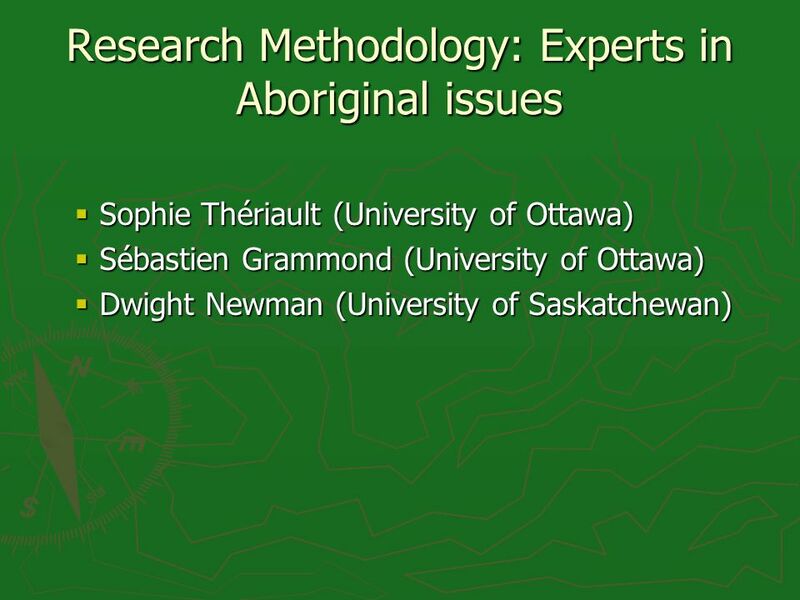 The informative aspect of the process would include supplying the aboriginal people with sufficient detail and explanation of this information to allow a meaningful understanding of the whole situation. All of this information should be presented in an understandable manner. 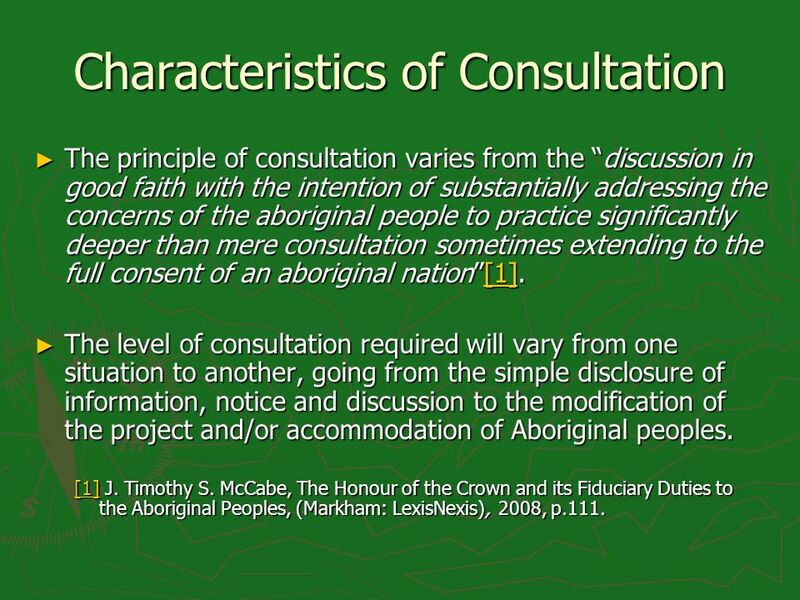 In order to be meaningful, the consultation process should lead to the inclusion of the Aboriginal peoples input on the issue. The project, if necessary, might have to be changed to better accommodate the arguments of the aboriginal people. In order to be meaningful, the consultation process should lead to the inclusion of the Aboriginal peoples input on the issue. The project, if necessary, might have to be changed to better accommodate the arguments of the aboriginal people. 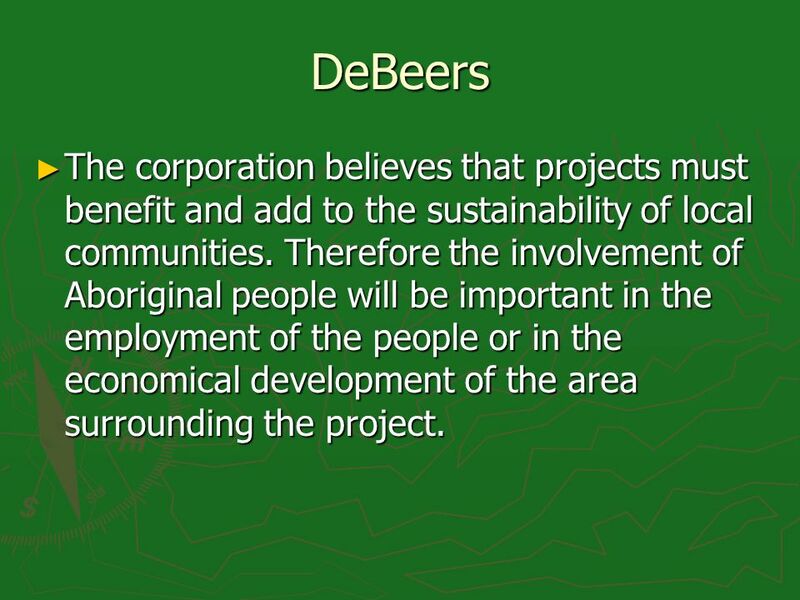 75 DeBeers The corporation believes that projects must benefit and add to the sustainability of local communities. Therefore the involvement of Aboriginal people will be important in the employment of the people or in the economical development of the area surrounding the project. The corporation believes that projects must benefit and add to the sustainability of local communities. Therefore the involvement of Aboriginal people will be important in the employment of the people or in the economical development of the area surrounding the project. 76 Industry BP Canada Energy Company: The discussion and consultation should take place at the very early stages of the entire project. The discussion and consultation should take place at the very early stages of the entire project. These processes should be directed toward issues relating to aboriginal people and, in the long run, should be beneficial to everyone. The information given to the aboriginal people should be delivered in a timely fashion in order to give them proper time to respond to the proposed plan. These processes should be directed toward issues relating to aboriginal people and, in the long run, should be beneficial to everyone. The information given to the aboriginal people should be delivered in a timely fashion in order to give them proper time to respond to the proposed plan. 77 BP Canada BP Canada believes in the better education of Aboriginal People, in the economical development of aboriginal businesses and proposes plans of action to better improve the life of aboriginal people in the surrounding region. 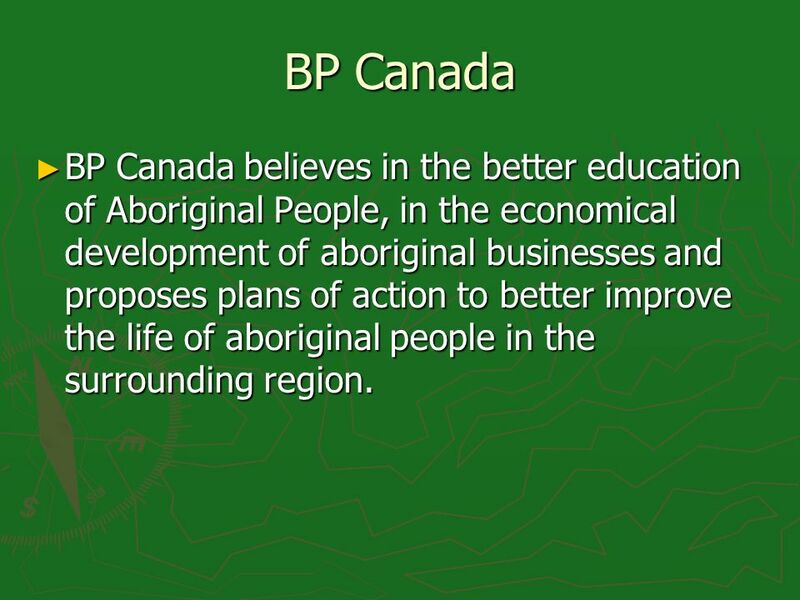 BP Canada believes in the better education of Aboriginal People, in the economical development of aboriginal businesses and proposes plans of action to better improve the life of aboriginal people in the surrounding region. 78 CAP on Industry It could be advantageous for CAP to include some of the progressive positions of specific corporations into their future national policy position. 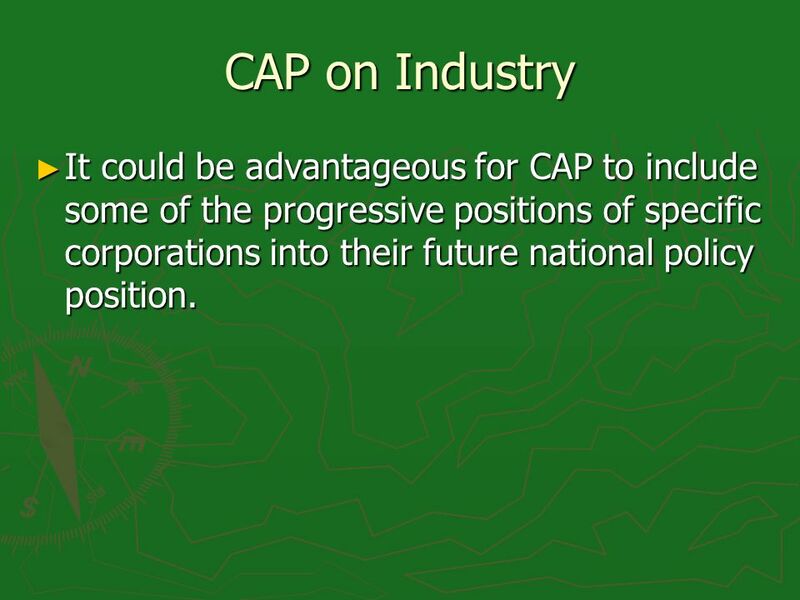 It could be advantageous for CAP to include some of the progressive positions of specific corporations into their future national policy position. 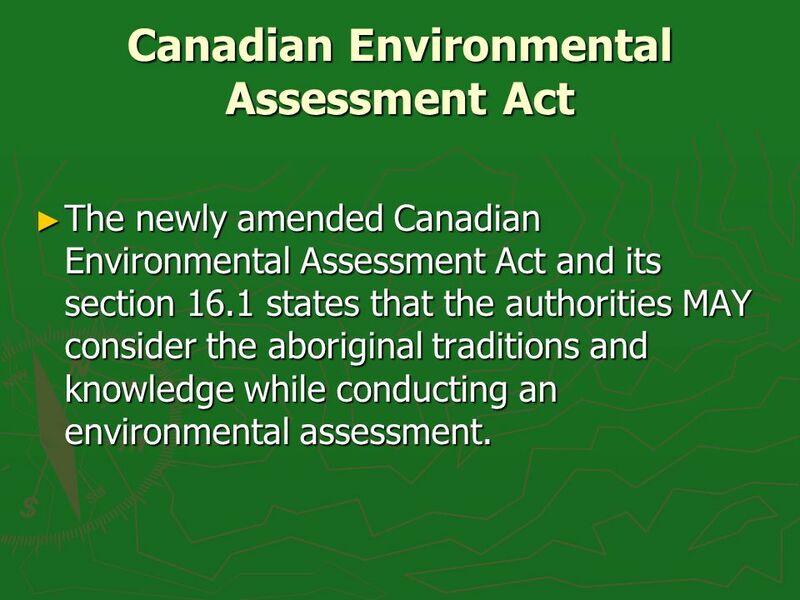 79 Canadian Environmental Assessment Act The newly amended Canadian Environmental Assessment Act and its section 16.1 states that the authorities MAY consider the aboriginal traditions and knowledge while conducting an environmental assessment. The newly amended Canadian Environmental Assessment Act and its section 16.1 states that the authorities MAY consider the aboriginal traditions and knowledge while conducting an environmental assessment. 80 Canadian Environmental Assessment Act In the policy position the government states that the consideration of aboriginal traditional knowledge will not discharge any fiduciary duties of consultation that may arise. 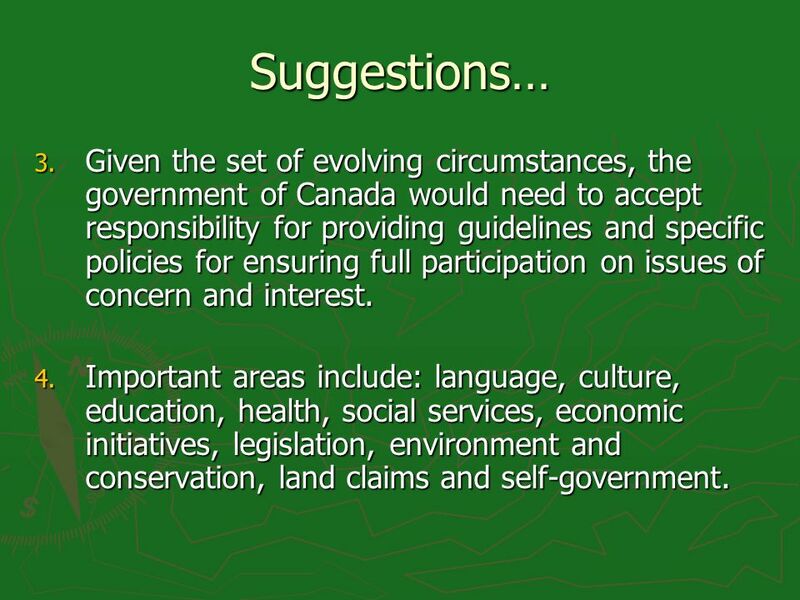 In the policy position the government states that the consideration of aboriginal traditional knowledge will not discharge any fiduciary duties of consultation that may arise. The government also states that this consideration process should be dealt with on a case-by-case basis and that a one-size-fit-all approach to this situation is simply unthinkable. The government also states that this consideration process should be dealt with on a case-by-case basis and that a one-size-fit-all approach to this situation is simply unthinkable. 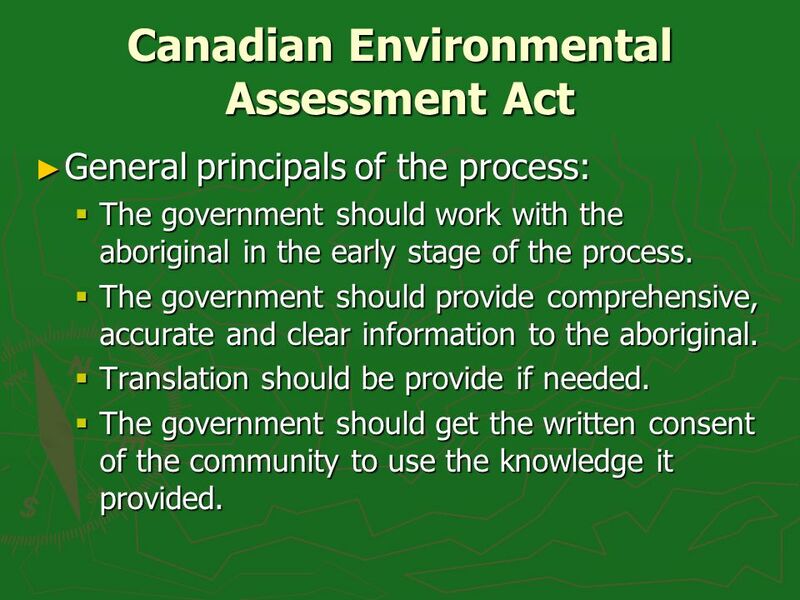 81 Canadian Environmental Assessment Act General principals of the process: General principals of the process: The government should work with the aboriginal in the early stage of the process. The government should work with the aboriginal in the early stage of the process. The government should provide comprehensive, accurate and clear information to the aboriginal. The government should provide comprehensive, accurate and clear information to the aboriginal. Translation should be provide if needed. Translation should be provide if needed. The government should get the written consent of the community to use the knowledge it provided. The government should get the written consent of the community to use the knowledge it provided. 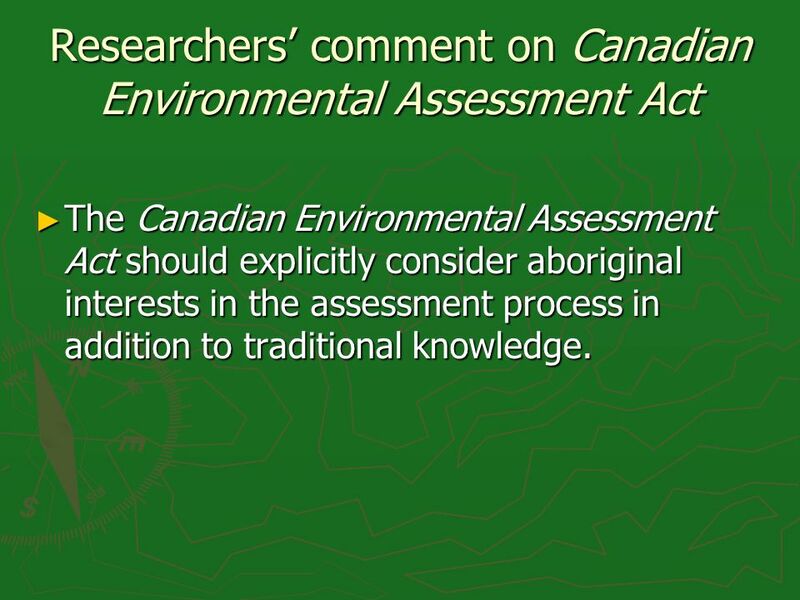 82 Researchers comment on Canadian Environmental Assessment Act The Canadian Environmental Assessment Act should explicitly consider aboriginal interests in the assessment process in addition to traditional knowledge. The Canadian Environmental Assessment Act should explicitly consider aboriginal interests in the assessment process in addition to traditional knowledge. 83 CAP incorporating principles of Canadian Environmental Assessment Act policy CAP could include a detailed policy on environmental assessment. CAP could include a detailed policy on environmental assessment. 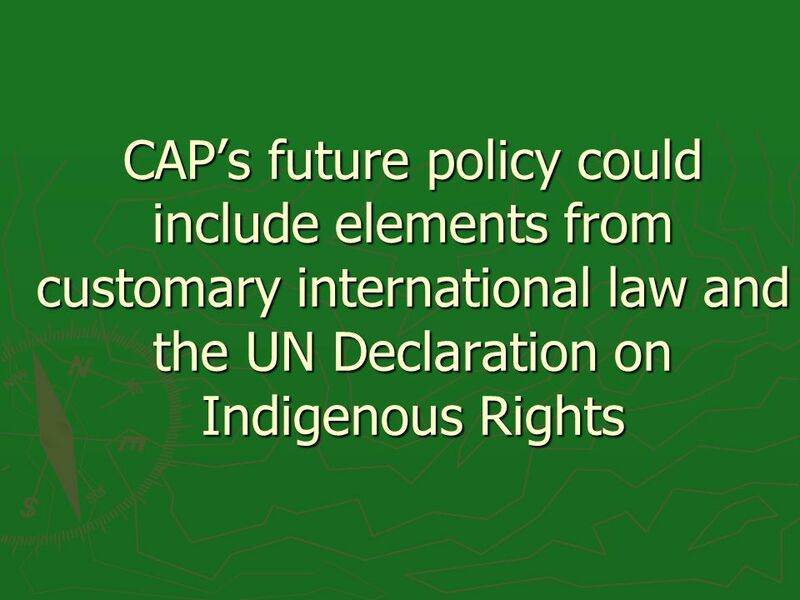 In a future policy, CAP could include clauses specifically referring to traditional knowledge and the consideration of aboriginal interests. 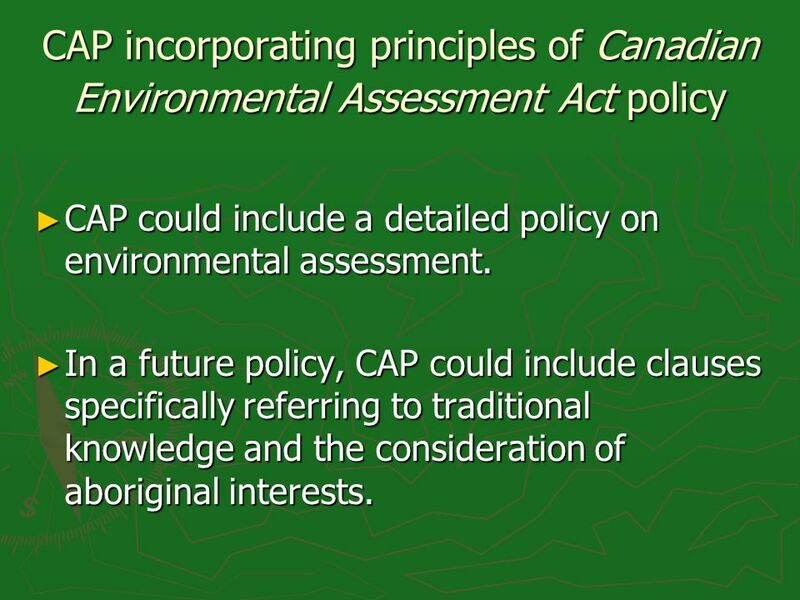 In a future policy, CAP could include clauses specifically referring to traditional knowledge and the consideration of aboriginal interests. 84 Conclusion on Duty to Consult There is a general corpus of subject-matters covered by the Honour of the Crown that is considered binding on the government of Canada. These include the fiduciary duty and the duty to consult. There is a general corpus of subject-matters covered by the Honour of the Crown that is considered binding on the government of Canada. These include the fiduciary duty and the duty to consult. 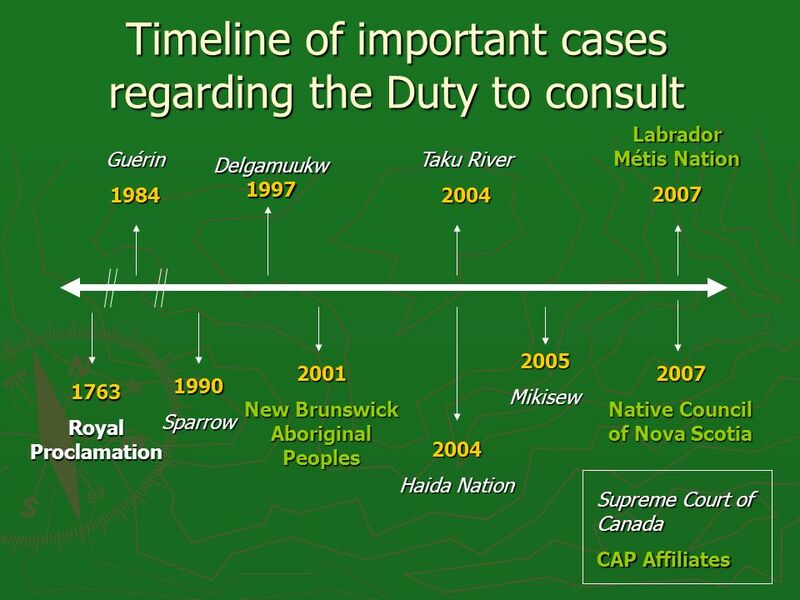 The Crown has legal duty to consult CAP and affiliates who represent Aboriginal Peoples and according to the interpretation of standards have been set by Courts and international law and advanced by authors and aboriginal advocates. 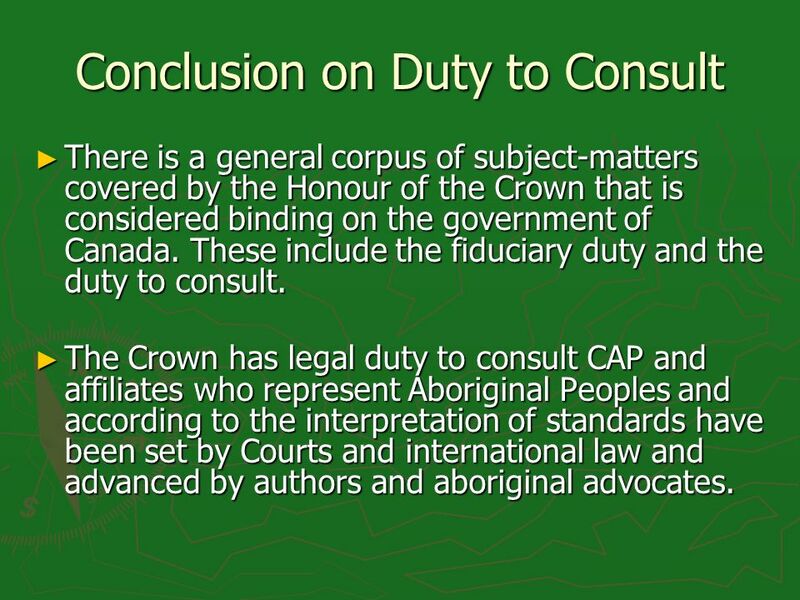 The Crown has legal duty to consult CAP and affiliates who represent Aboriginal Peoples and according to the interpretation of standards have been set by Courts and international law and advanced by authors and aboriginal advocates. 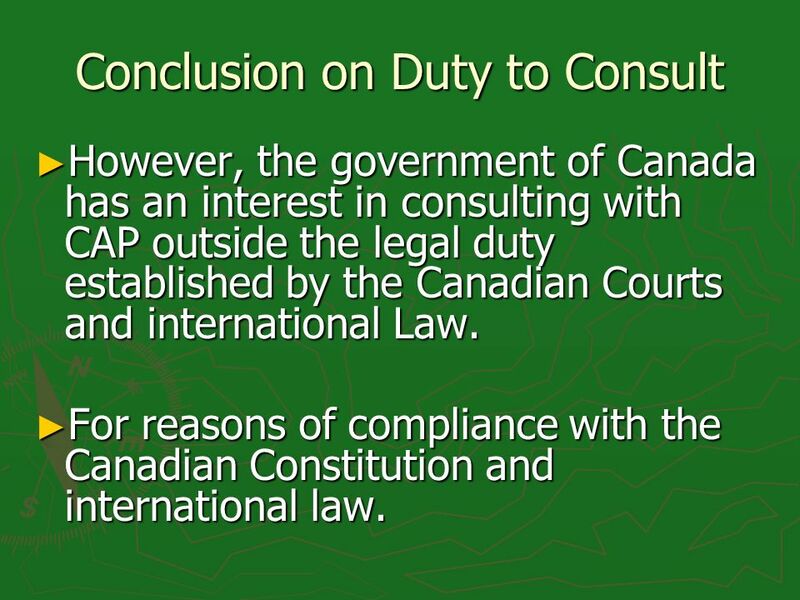 85 Conclusion on Duty to Consult However, the government of Canada has an interest in consulting with CAP outside the legal duty established by the Canadian Courts and international Law. However, the government of Canada has an interest in consulting with CAP outside the legal duty established by the Canadian Courts and international Law. For reasons of compliance with the Canadian Constitution and international law. For reasons of compliance with the Canadian Constitution and international law. 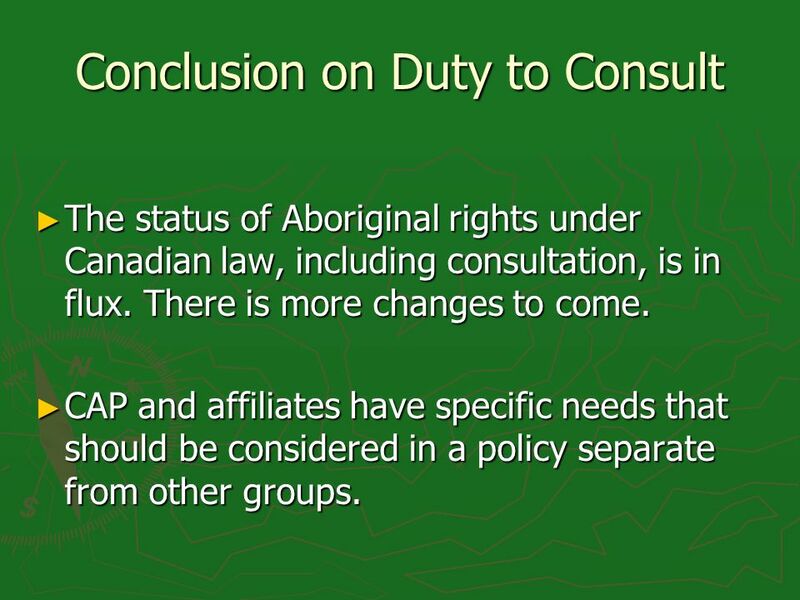 86 Conclusion on Duty to Consult The status of Aboriginal rights under Canadian law, including consultation, is in flux. There is more changes to come. The status of Aboriginal rights under Canadian law, including consultation, is in flux. There is more changes to come. CAP and affiliates have specific needs that should be considered in a policy separate from other groups. CAP and affiliates have specific needs that should be considered in a policy separate from other groups. 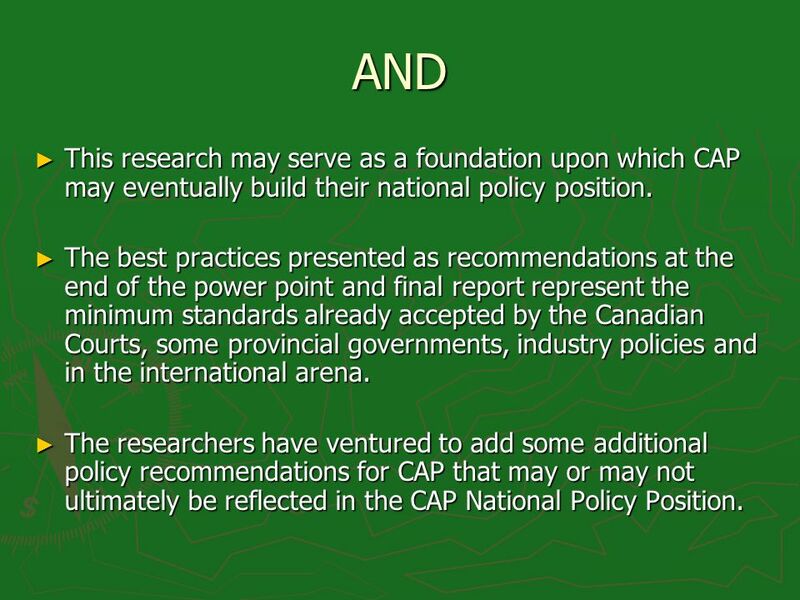 87 Suggestions from researchers to CAP for consideration in a future national policy position 1. Meaningful consultations should be held at the community level in order to develop a representative national policy position. 2. Ensure that sufficient time and resources should be allocated for this purpose. 3. A tool incorporating the Spectrum of consultation could be developed in order to pre-assess the strength of the claim. 4. Claims that are even doubtful and marginal should be brought forth to the government of Canada (Haida Nation). 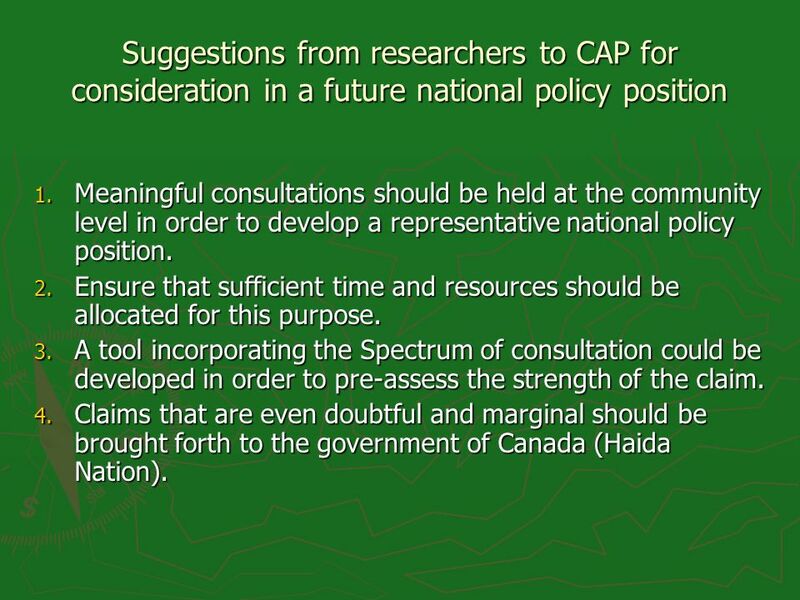 88 Suggestions from researchers to CAP for consideration in a future national policy position 5. Capacity must be enhanced – to eventually have trained staff at the national and affiliate level to deal with questions and documentation relating to consultation and other issues of concern. 6. Documentation should be drafted in plain language for both parties. 7. The policy should explicitly detail the process for consultation and off-reserve (both urban and rural areas), non-status, Métis. 89 Suggestions… 8. Consultation should always be meaningful and in good faith. 9. 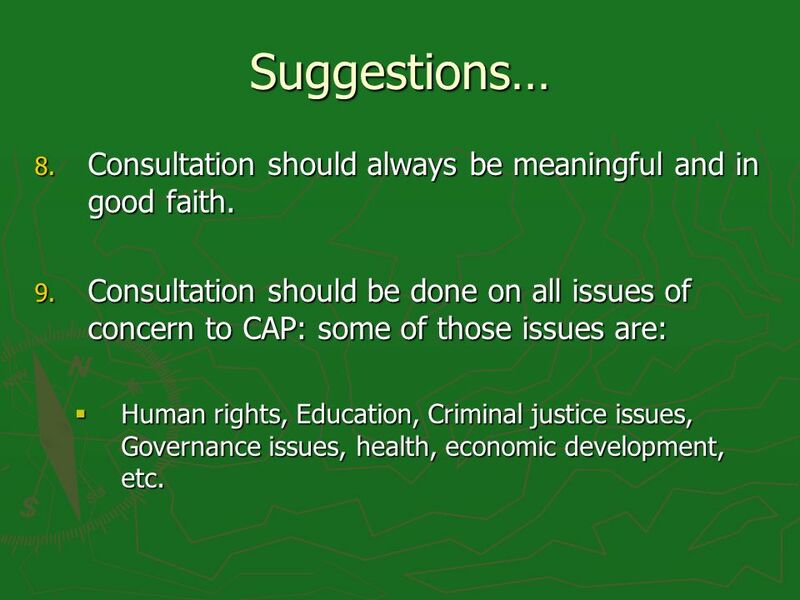 Consultation should be done on all issues of concern to CAP: some of those issues are: Human rights, Education, Criminal justice issues, Governance issues, health, economic development, etc. Human rights, Education, Criminal justice issues, Governance issues, health, economic development, etc. 90 Suggestions… 10. 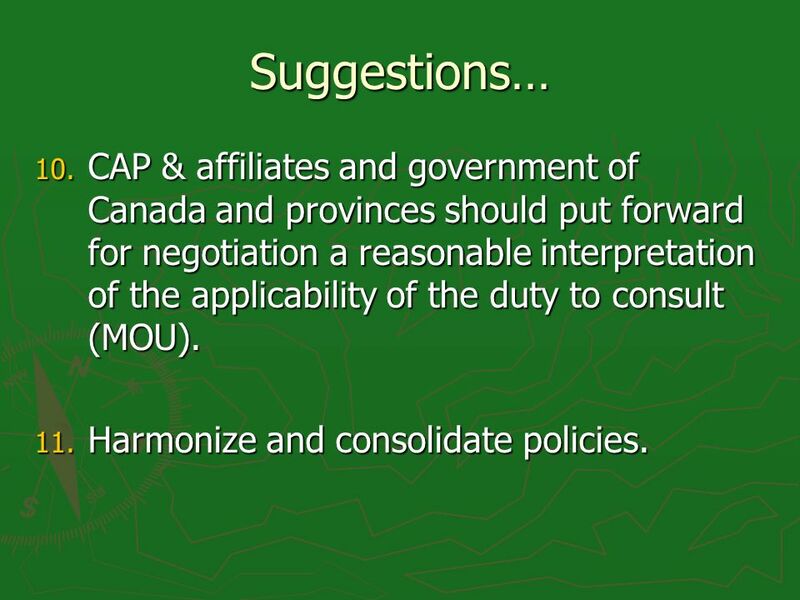 CAP & affiliates and government of Canada and provinces should put forward for negotiation a reasonable interpretation of the applicability of the duty to consult (MOU). 11. Harmonize and consolidate policies. 91 Suggestions… 12. CAP should develop internal duty to consult policies in order to deal with the questions put forward in a practical and effective manner. 92 Researchers suggestions for Government 1. The right to participation should encompass setting up of a framework for participation that is sensitive to the differing orientations and aspirations of CAP & affiliates. 2. 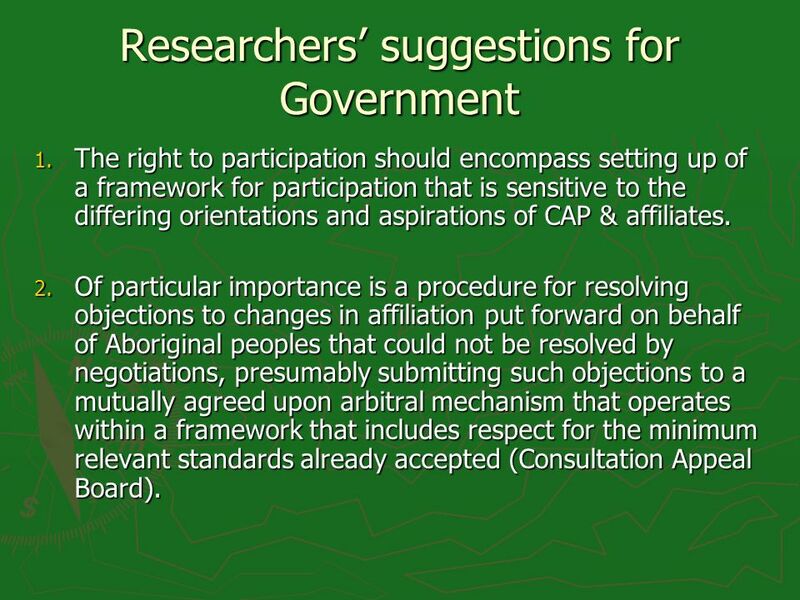 Of particular importance is a procedure for resolving objections to changes in affiliation put forward on behalf of Aboriginal peoples that could not be resolved by negotiations, presumably submitting such objections to a mutually agreed upon arbitral mechanism that operates within a framework that includes respect for the minimum relevant standards already accepted (Consultation Appeal Board). 93 Suggestions… 3. Given the set of evolving circumstances, the government of Canada would need to accept responsibility for providing guidelines and specific policies for ensuring full participation on issues of concern and interest. 4. Important areas include: language, culture, education, health, social services, economic initiatives, legislation, environment and conservation, land claims and self-government. 94 Suggestions… 5. The creation of the Aboriginal Affairs coordinator and the Interministerial support group. 6. Consultation should be done with band councils and not with individuals, which would take up too much time and third parties might be asked to be included if they want to. 7. 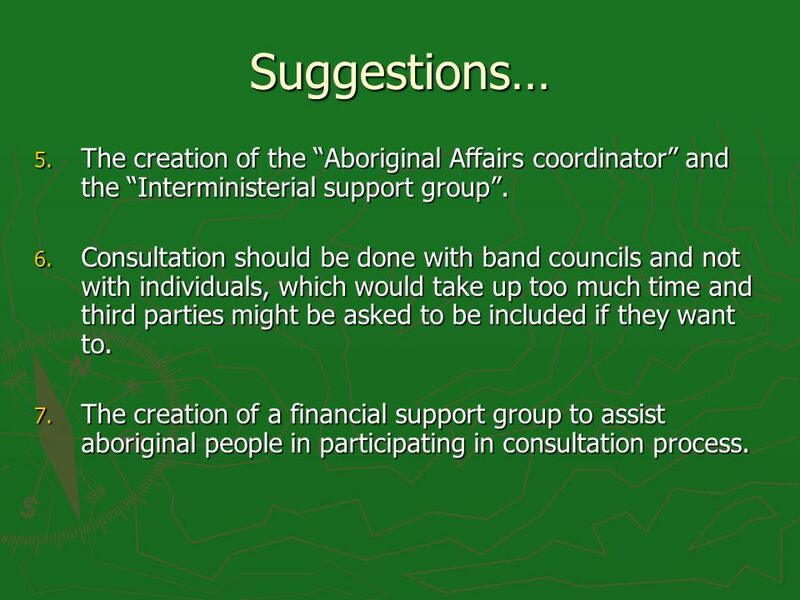 The creation of a financial support group to assist aboriginal people in participating in consultation process. 95 Suggestions… 8. All documents addressed to aboriginal people should have an approach that is easy to understand. 9. If a request is made for the translation of a document, then the government should have that text translated in a clear, understandable and plain language. 96 Duty to consult This study will serve as a foundation for CAP to develop a national policy position after meaningful consultation within its affiliates communities. This study will serve as a foundation for CAP to develop a national policy position after meaningful consultation within its affiliates communities. 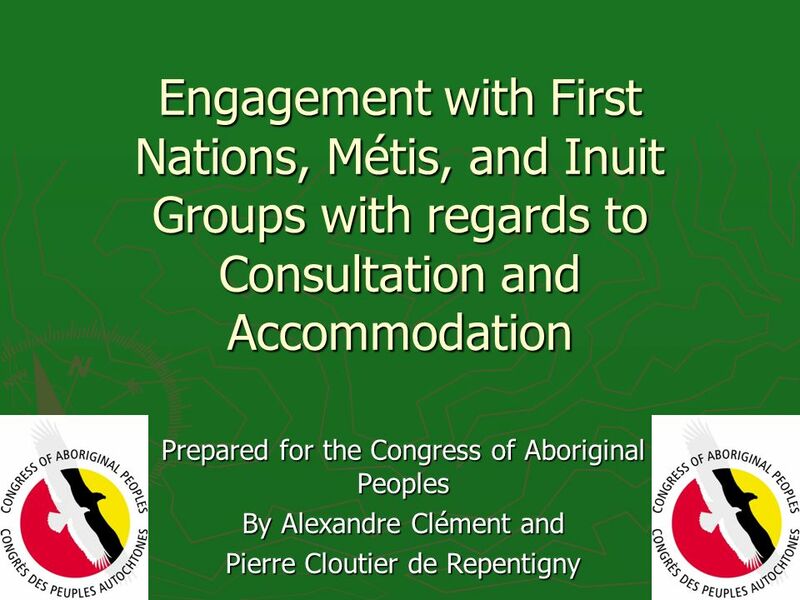 Download ppt "Engagement with First Nations, Métis, and Inuit Groups with regards to Consultation and Accommodation Prepared for the Congress of Aboriginal Peoples By." National Centre for First Nations Governance 1 Our Inherent Right to Self-Government. Enforcement issues, including status of ITU-T Recommendations APT-ITU workshop on the International Telecommunications Regulations Bangkok, 6-8 February. 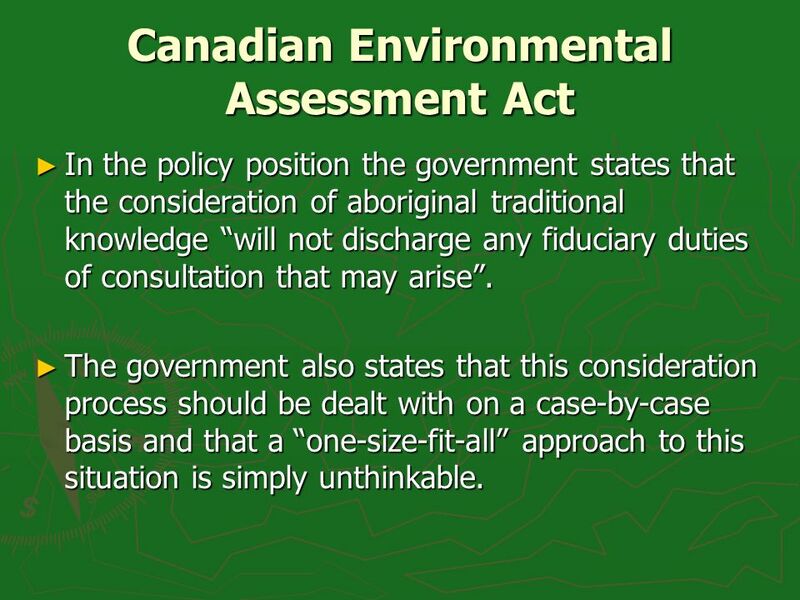 The Canadian Environmental Assessment Act 2012 and Aboriginal Consultation November 2012. NHCN presentation– Consultation and Accommodation June 23rd, 2009 Aimée Craft – Public Interest Law Centre. THE DIVERSITY OF INTERESTS IN ENVIRONMENTAL GOVERNANCE A CHALLENGE FOR THE RULE OF LAW By Professor D E Fisher. HAYLEA CAMPBELL SUSTAINABLE PROCUREMENT IN THE EU. 1 Developing a Community Constitution. 2 What is a community constitution? A “core institution” of governance and arguably the most powerful tool to develop. PROPONENT INVOLVEMENT IN CONSULTATION Presentation to the Geology Matters Community Engagement Workshop October 30, 2012 Consultation with the Mi’kmaq. PROPONENT INVOLVEMENT IN CONSULTATION Presentation to the Geology Matters Environmental Assessment Workshop November 14, 2013 Consultation with the Mi’kmaq. Consultation Conference New Brunswick First Nations Training Seminar and Strategy Session The Legal Duty to Consult and Canada’s Approach to Aboriginal. Specific Claims Department – Lands and Resources Secretariat Specific Claim Negotiations Current Challenges Ottawa, On October 2014. Alberta Aboriginal Consultation Process Dave Coish, Aboriginal Consultation Unit, SRD Presentation to the CAPF February 9, 10, & 11, 2010. Mediation as a Source of Law Dale Dewhurst Athabasca University New York – IALMH, 2009. EU: Bilateral Agreements of Member States. Formerly concluded international agreements of Member States with third countries Article 351 TFEU The rights. IAEA International Atomic Energy Agency Overview of legal framework Regional Workshop - School for Drafting Regulations 3-14 November 2014 Abdelmadjid.